The Life and Travels of The Ellingers: Moving Emily To Oregon.... Finally! Moving Emily To Oregon.... Finally! Click the Links in this entry to explore the sites we went to and to check out photo slide shows. Finally, Emily will join me in Oregon! Over a week and a half ago I flew home to NY to visit my parents and to start my drive across the country with Emily to Oregon. The first few days I was home I visited my parents. It was a tough visit because I flew home the redeye on Wednesday evening and then on Thursday evening after dinner with my parents had to take my mother to the emergency room because of shoulder and chest pain. So, since Tuesday night the first time I was able to close my eyes on the trip was Friday at about 4am in the morning... I thought that the ordeal with my mother would be over with by the time I left but it had only just begun... I'll talk about that in my next blog entry. Friday night I ended up going out with Emily and her friends and meeting up with Mike Lamanto (who introduced Emily and I). I first went over to Logan and Jacquie's new house just outside of Saratoga Springs. They had bought it pretty run down but with the help of parents and a lot of effort had completely flipped the home and are going to sell it for a pretty nice profit. I got to see all their wedding album photos and felt really bad I wasn't able to attend their wedding last summer because of work in Eastern Washington. They had a beautiful wedding on the shores of Lake George. The three of us then went out and met Emily and her friends out at a bar in Saratoga for drinks, eventually ending up at The Bullpen. It was great to see everyone again, even if it was just for a brief night of drinks during track season in Saratoga. On Saturday morning Emily's parents showed up to help us pack up Nina the Nissan for the long trip. We put a giant turtle shell on the car's roof to hold larger items and packed the back seats and trunk completely full. The car was definitely sagging in the rear. Her dad seemed to have an art to packing a car that he was proud of. We ended up leaving around noon after a late breakfast with the family. We drove for about 8 or 9 hours to Sandusky, OH where we stayed at a Howard Johnson Inn for the night. We went to a cheaper place first but it was falling apart and the lightbulbs in the room were dead so we moved on. Dinner was at McDonald's if I remember right... it was a late night. 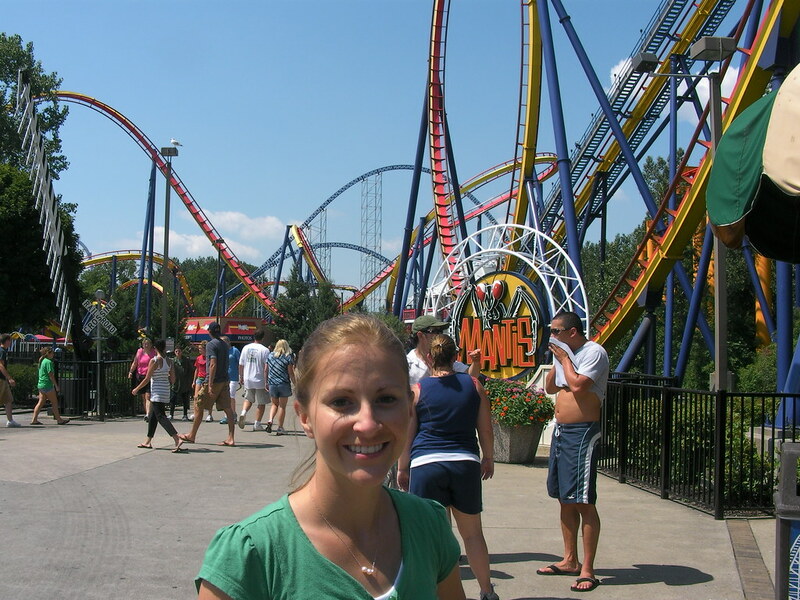 Sunday - The start of our fun trip at Cedar Point - Roller Coaster Capital of the World. 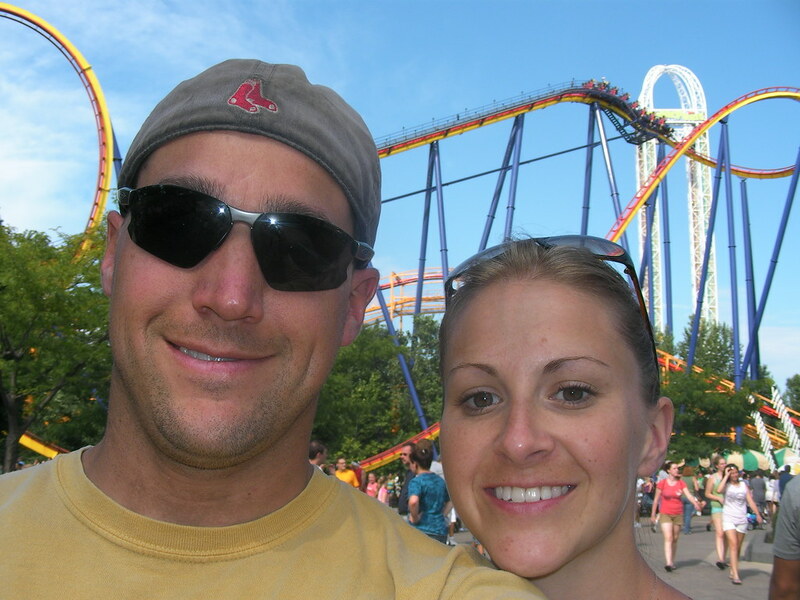 On sunday we decided to spend the day at Cedar Point Amusement Park. every walkway in the park. Because it was a Sunday we hit lines... I'm talking 1-2 hour waiting lines for each of the major rollercoasters. We stayed from 10 in the morning until 4:30 at night and we only were able to ride 5 coasters in that time. The List of Coasters There. Magnum XL-200 (Voted Best Steel roller coaster in the world, 205ft high, 72mph). began to slide back down to the loading station. This was the only ride that Emily and I were able to get the front two seats so it was blatantly apparent over the video camera mounted on the track when I began to pull out my camera... hehe. They took my camera which sucked because I thought it was the best ride in the park. Although we only were able to ride 5 coasters we had a really great time in the park and I feel we hit the best ones for sure. 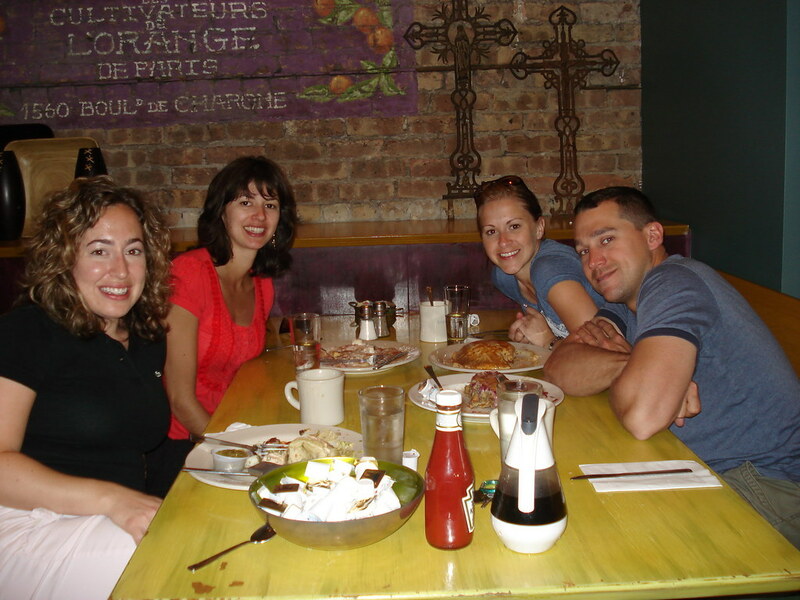 We then spent 4 hour driving into Chicago to meet up with Emily's high school friends Ashley and Becky. Before reaching the city we were pretty much on fumes and had to take a kinda sketchy drive into the ghetto of Chicago to get gas, praying the whole time we wouldn't run out there in the middle of the road and get robbed. 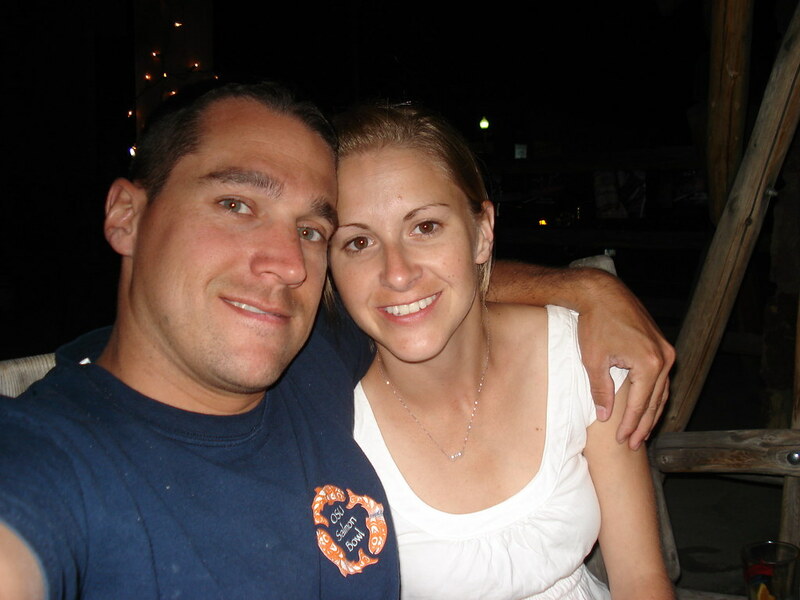 Ashley and Becky had a great place and cooked us up some pizza for dinner while reminiscing about the past. After a fantastic breakfast at the Bongo Room with Emily's friends we hit the road out of Chicago towards the Badlands as far as we could get because it was going to be a full day of driving for sure. I was of course playing with my new iphone the entire trip so we started to look up touristy type places to visit on our way out. The first place we found on the map was a town called the Wisconsin Dells. Apparently this small place in the middle of Wisconsin is the water park capital of the world. When we drove into the town we saw multiple amusement parks and a bunch of water parks. 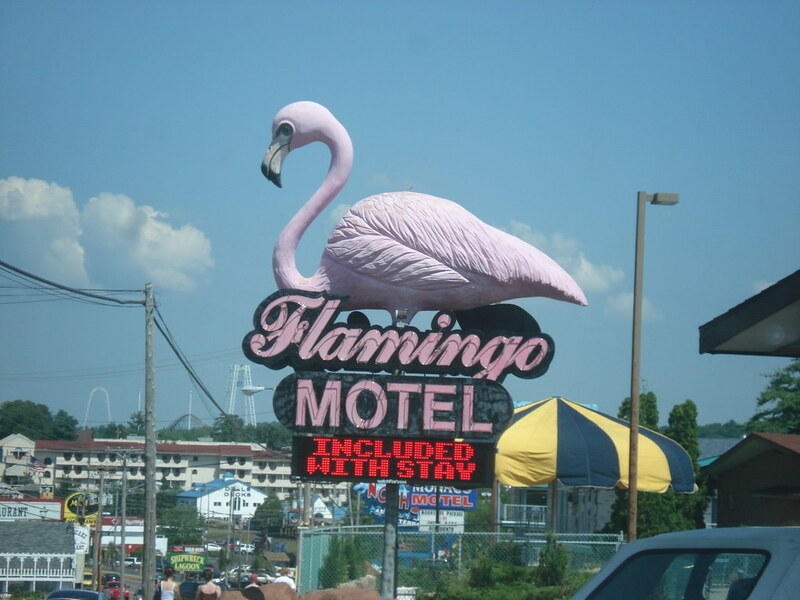 We had originally pulled off to see the World's Biggest Flamingo (lame! ), but then we wanted to do a little exploring after seeing a giant Trojan Horse and an upside down whitehouse. 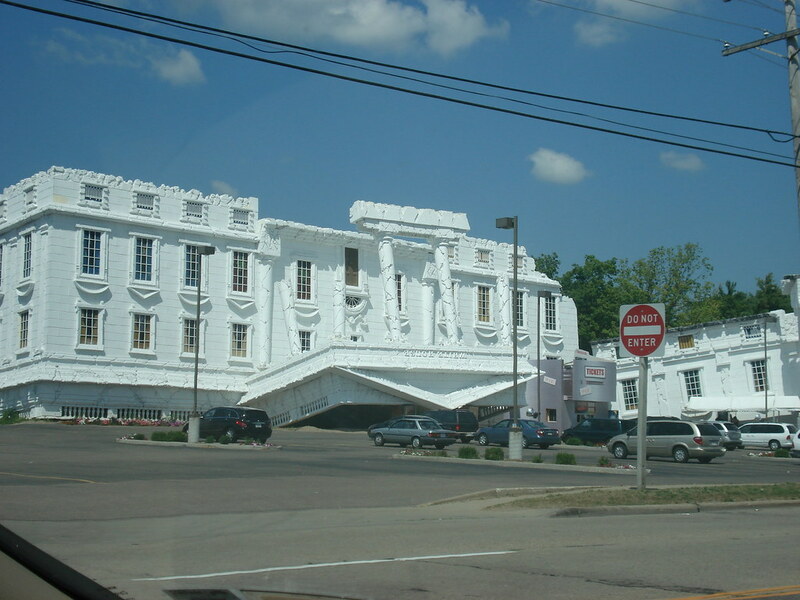 Apparently aliens had abducted the white house and dropped it upside down in Wisconsin for some reason!??? I though aliens were supposed to be intelligent... why would they pick Wisconsin!? Anyway, we didn't stay long in the town and made our way back to the highway. 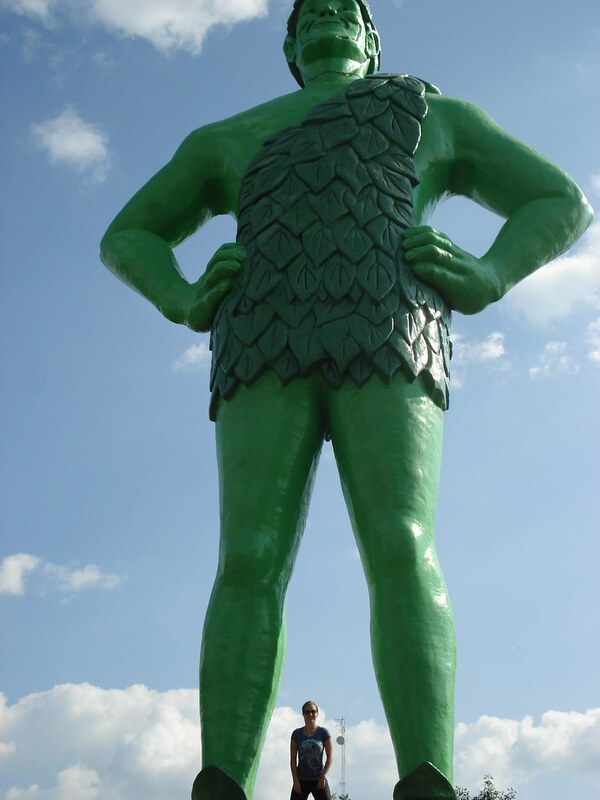 In Blue Earth, Minnesota we pulled off the road to get some ice cream at DQ and happened to come across a gigantic Jolly Green Giant next door. We took turns climbing up onto his big foot and taking photos. I don't know why a town would spend the money to build such a giant structure in the middle of nowhere off the highway? 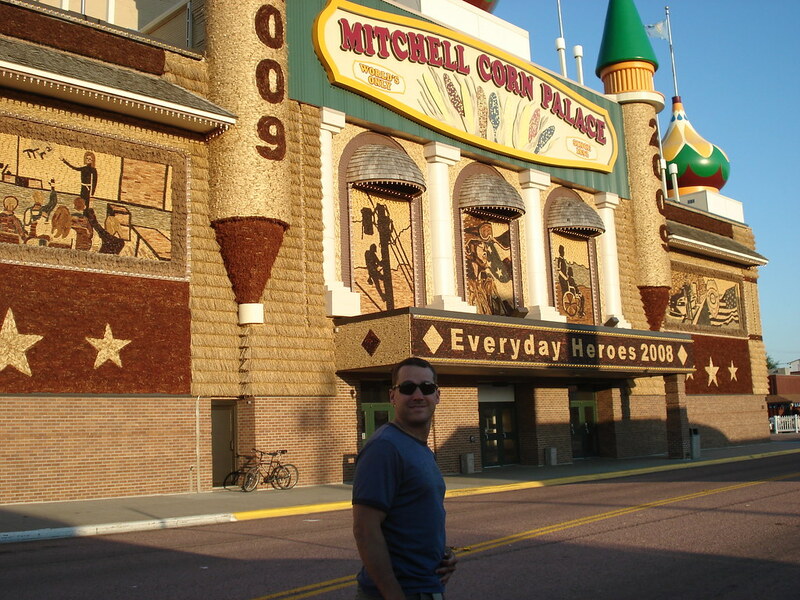 Further down I90 and closer to the Badlands we stopped to see the famous Corn Palace. Mostly because we saw about 200 roadside signs advertising how amazing it was. It was pretty cool that they change the outside of the brick building ever year with new murals made out of corn. This year they had a cop, a soldier, a man in a wheelchair, a teacher and a worker on a telephone pole on the front of the building. Inside the building was a small museum about the history of the palace (first one around the turn of the last century). There was also a stage and basketball course where it was apparent that local events would be held. I suppose it was a neat place to stop and see and being free I guess it was worth the 15 minute stop. We ended up driving to Murdo, SD where we found an amazing room for 60 bucks that included a whirlpool tub, free movies, a king size bed, pool access etc. Any other place in the U.S. that room would have been $200 easily but in the middle of SD all they could get was a measily $60. Best motel money we spent on the whole trip, and the pool was wonderful to go in before bed and watching Little Miss Sunshine. Tuesday was a really fun day. We left our motel early in the morning and drove to the turn off of I90 (exit 131) for the town of Interior and the East entrance to the Badlands but as we got off the exit and got gas we noticed a building talking about Cold War Missile Silo's near by and decided to check it out. 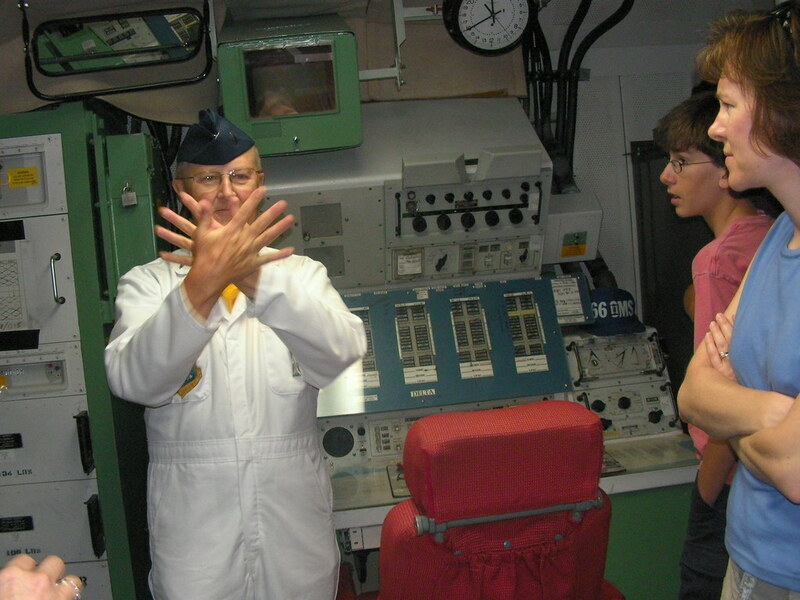 We were in luck as they were conducting free tours of the missile control centers which apparently only happen a few times a year by the national park service. So, we decided to check out one of the Minuteman Missile control centers just down the road before heading into the Badlands called Launch Control Facility Delta-01. We had to briefly wait outside the control center for our tour before going in so we had time to check out some very old army vehicles built to withstand a missile attack with glass windows well over 2 inches thick and reinforced with armor. The tour took us down several stories into a bunker where the operators worked in shifts. 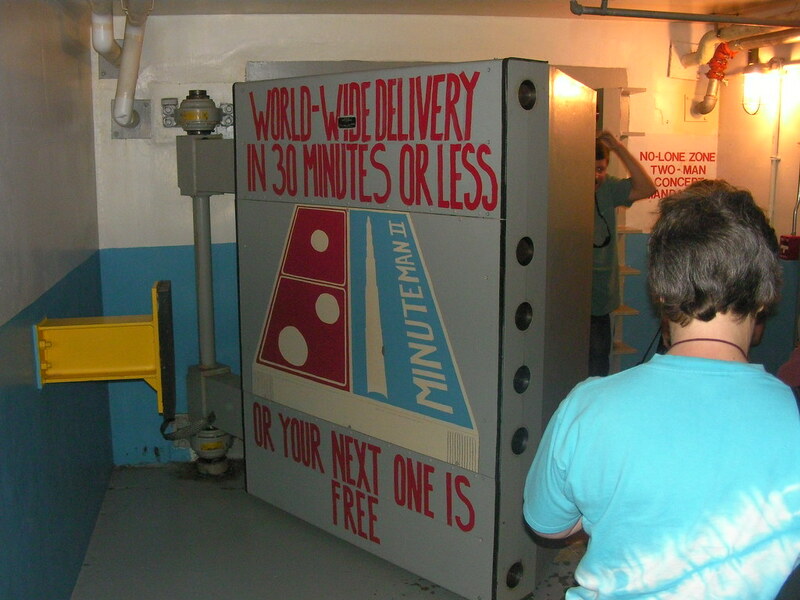 The door to the control room looked like a safe door and weighed over 2 tons and if pushed would take several people to stop from closing due to the momentum generated (think stopping a heavy train). Inside the control room we were given a talk by one of the actual operators who was posted at the site during the cold war. It was really interesting hearing about how close we were to destroying the world back then and the capabilities and deadliness of missiles that could circle the earth and hit their targets in less than half an hour (thus the name "minuteman") traveling at speeds of over 15,000 mph! It was definitely worth the stop and I'm happy we were able to get to see it for free. We didn't get to see the actual missile silo which was located several miles away. It was also chilling to hear that everyone stationed there were pretty much considered expendable by the military because if a missile ever hit near their location they were pretty much sealed in from the radiation to die slowly without food... Thankfully that war is over and the threat of death from nuclear fallout has almost all but vanished. Maybe the our race isn't as dumb as I sometimes think. 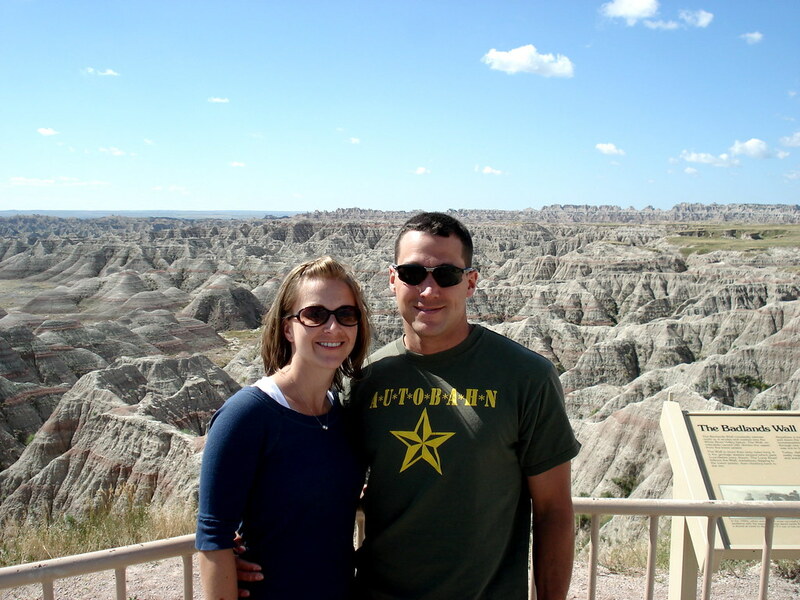 After touring the missile launch center we began our drive through the park scenic road of the Badlands. 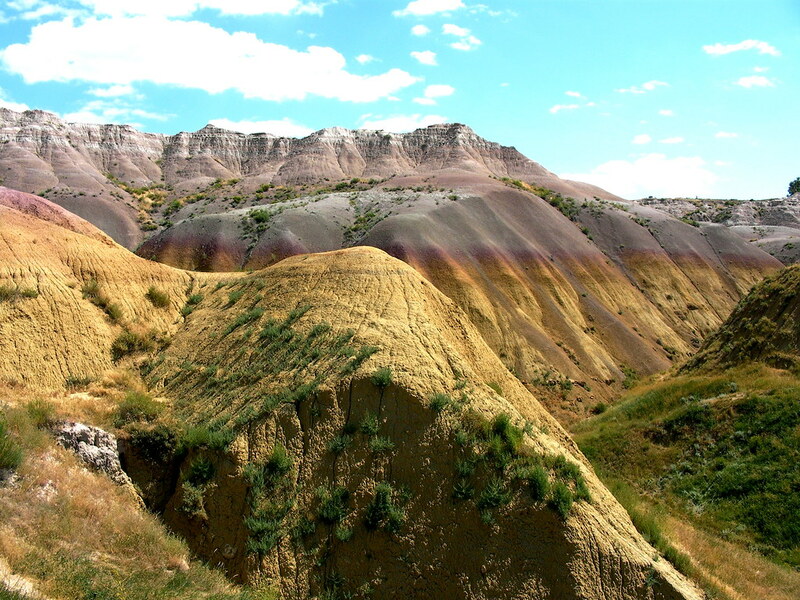 The colors and beauty of the Badlands was absolutely amazing. The different colors of the rock spires show the different depositional layers of the land through time. Some layers are ancient ash layers from world wide volcanic events. 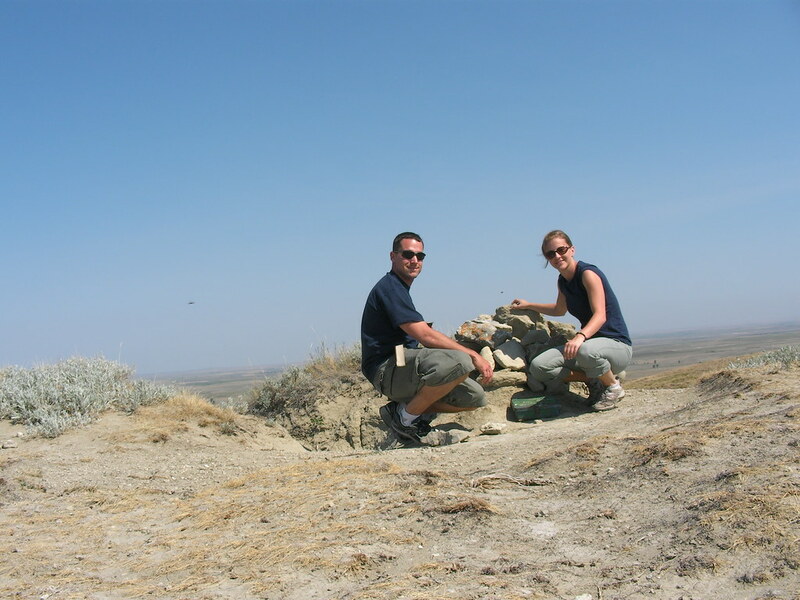 The area began eroding about 500,000 years ago when the area used to be a flat flood plain. Over the years the land eroded away around the tougher, denser rock leaving deep canyons, flat topped tables of land and spires all over the landscape. 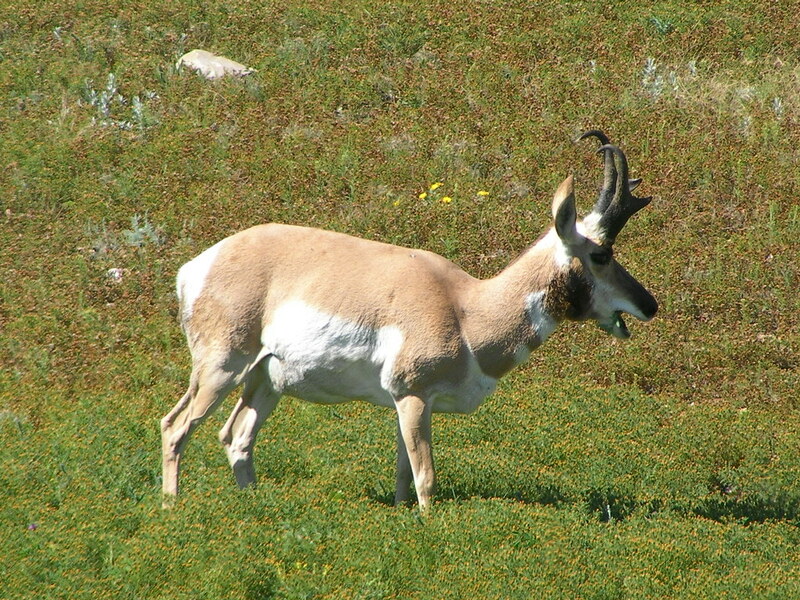 It is also one of the worlds greatest concentration of mammal fossils. 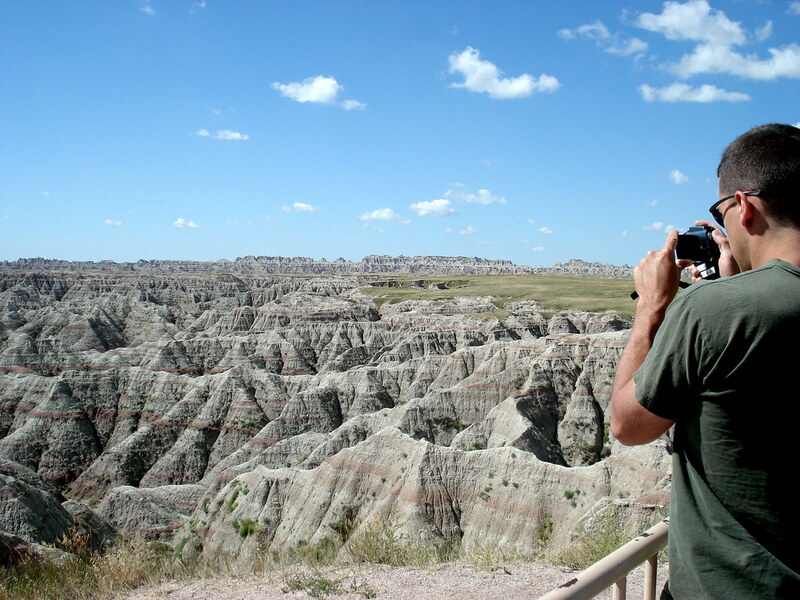 The buttes erode about 1 inch every year and it is said that in another 500,000 years the area will be completely flat again. Driving the road was really amazing and near the Western boundary Emily was able to see her first group of wild Bighorn Sheep on the side of the road as well as her first family of prairie dogs. On our way out of the park we decided to head up to Wall, SD to check out the famous Wall Drug there that we had seen well over 100 road side signs advertising. Let me just say this... Drive by it! It is a complete tourist trap that even has a cheesy tyranasaurus in the "backyard" along with piano playing singing gorilla etc... There are about 20 different shops of cheesy western U.S. trinkets and nothing interesting that you could actually see or do for free. 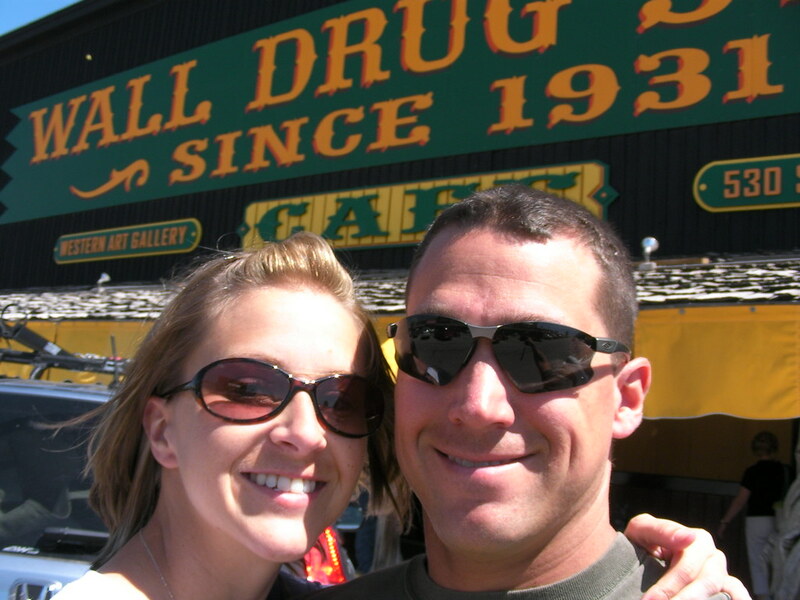 We stopped simply to say that we had been to Wall Drug. The only thing good about the place was that back in the day it gave away free water and coffee to travelers headed west. 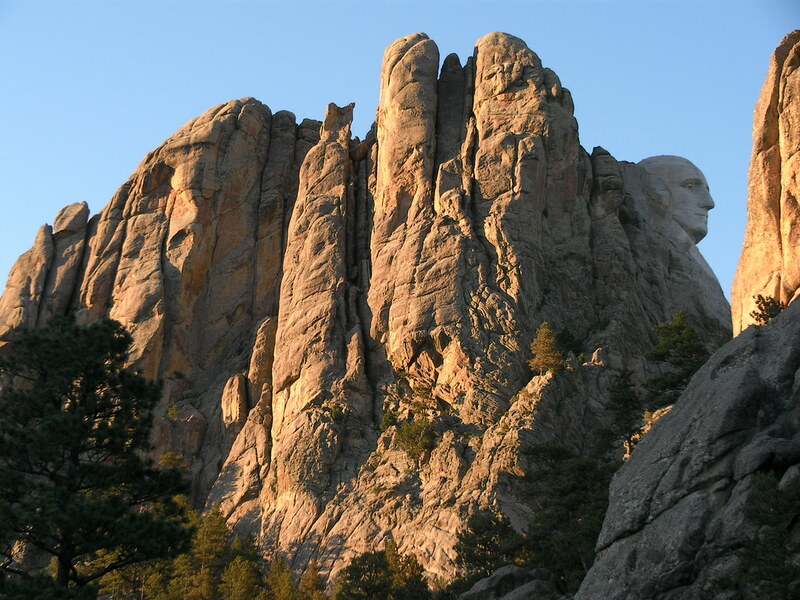 We then entered the Black Hills of South Dakota by heading through Custer State Park. The park is a fee area but they allowed us to drive through the park for free as it was the only way to get to Wind Cave National Park with the condition that we didn't get off the main park road to explore any of the sites in the park... which we of course promptly did anyway. 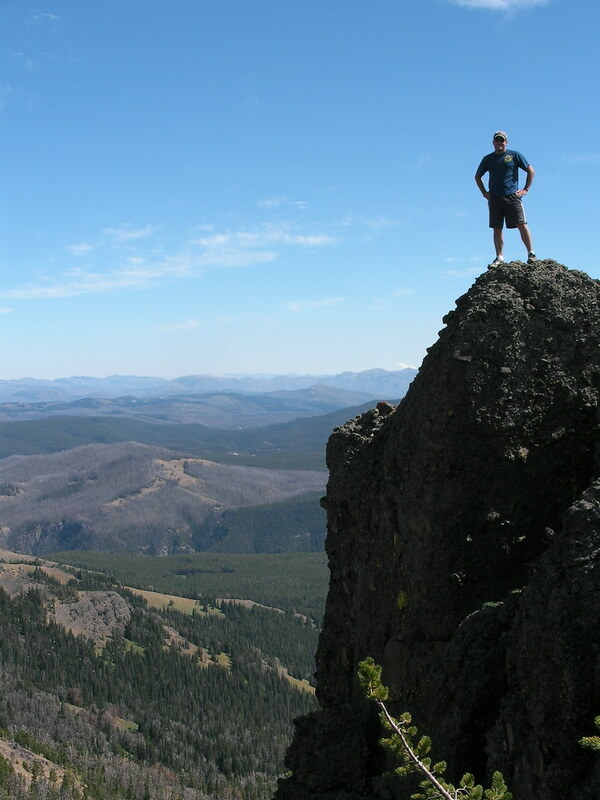 We decided after a few miles to pull of the road and drive to the top of a small peak overlooking the main section of the Black Hills including Harney Peak which I had climbed back in 1999 (the high point of South Dakota). We could also clearly see Cathedral Rocks on the trail towards Harney Peak as well. Looking East we could barely make out the Badlands which we had driven through earlier in the day. 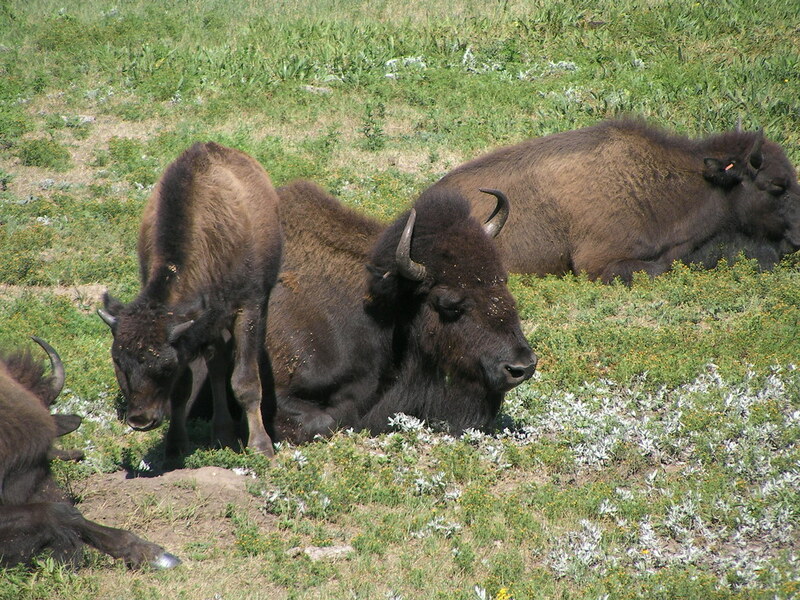 Just as we were leaving Custer State Park and close to Wind Cave we came across the first wild herd of Buffalo on the side of the road for Emily to check out as well as a pronghorn sheep also on the side of the road. Wind Cave was absolutely amazing. It is the world's 4th longest cave with over 129 miles of explored passageways weaving in a complex network of tunnels under just one square mile of land. 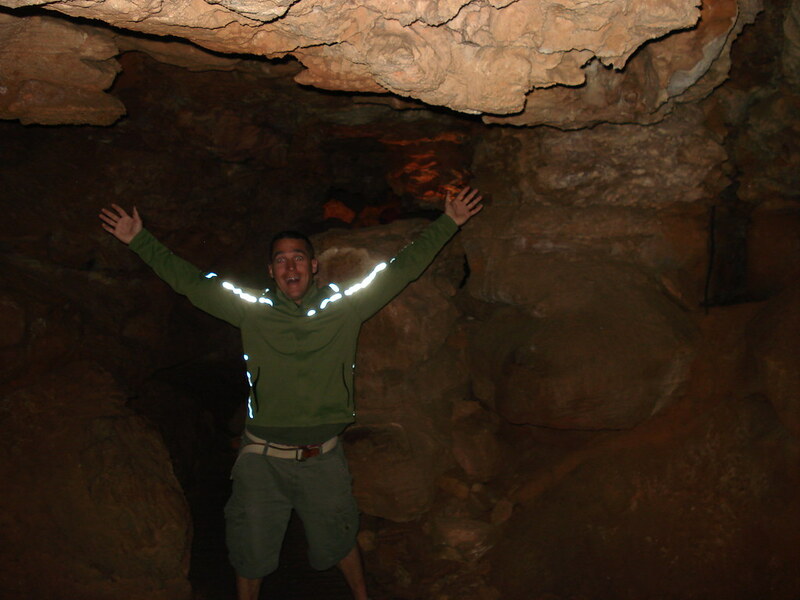 Wind studies within the cave only suggest that less that 5% of the total volume of the cave has been discovered and explored. That fact seemed amazing to me as I looked at a map of the cave and the different levels of it beneath the ground. The cave is formed from the Madison Limestone formation and with portions over 300 million years old it is one of the oldest in the world. Over millions of years of water dripping through the ground miles and miles of passages were created as cracks opened up as the land was being uplifted by local geological events. The cave was actually discovered by several settlers walking through woods who suddenly heard loud gusts of wind coming from behind some bushes on a calm day. They found a hole in the ground with wind coming out so strongly that they could barely put their heads near the hole to look in. 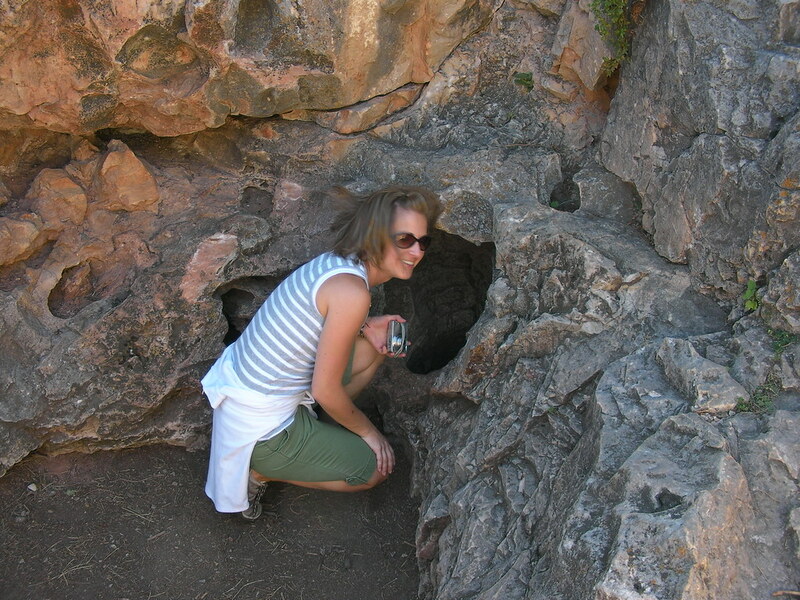 I got a great photo of Emily looking into the original hole with her hair being blown back. 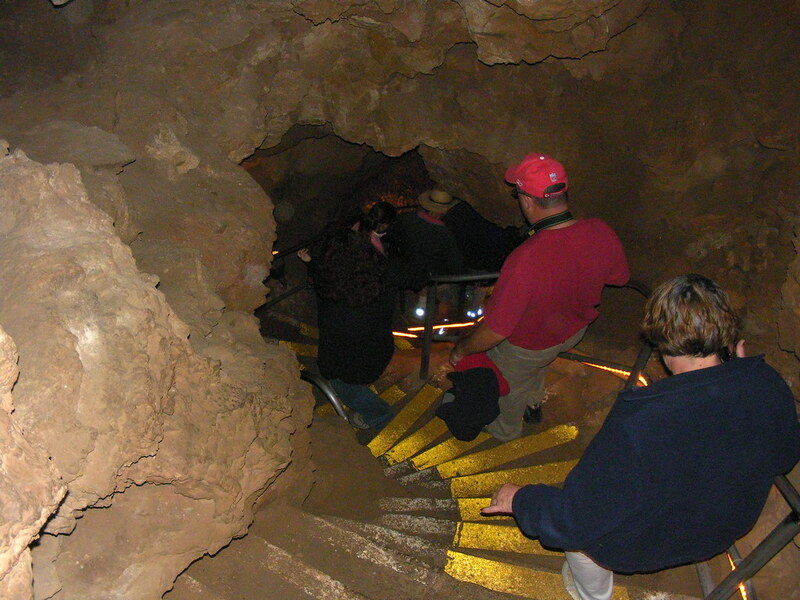 A small teen was lowered into the cave originally with a candle lantern to explore the cave. Later a man named Alvin spent his whole life exploring the cave hoping to explore all of it but eventually giving up saying he didn't think he'd ever find the end of the cave. 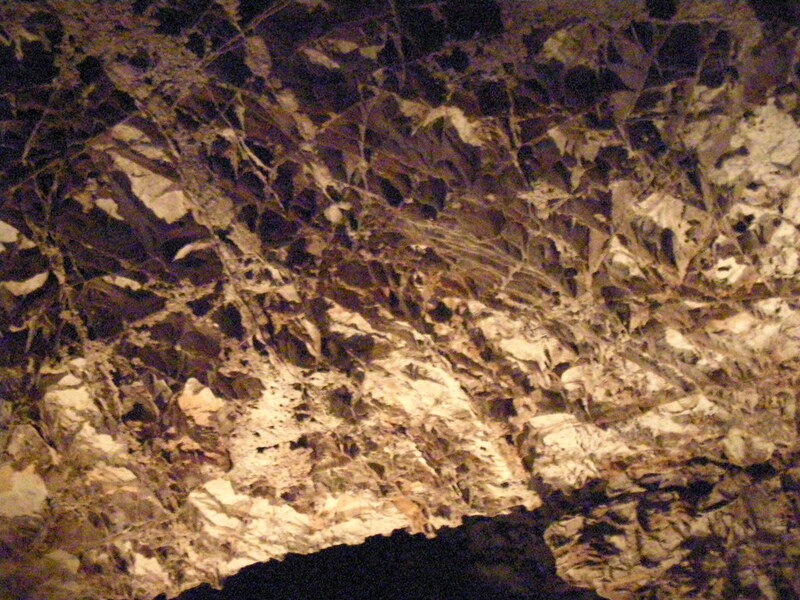 Wind cave is famous for the amount of boxwork contained within it. Click the word to read more about it but basically it is the remnants of harder minerals left in cracks that remain as the rest of the wall erodes around them. Some of the boxwork is so thin that simply touching it will cause it to crumble. Emily and I took the Natural Entrance Cave tour for just over an hour and got to walk through an extensive section of the cave about a half mile long. 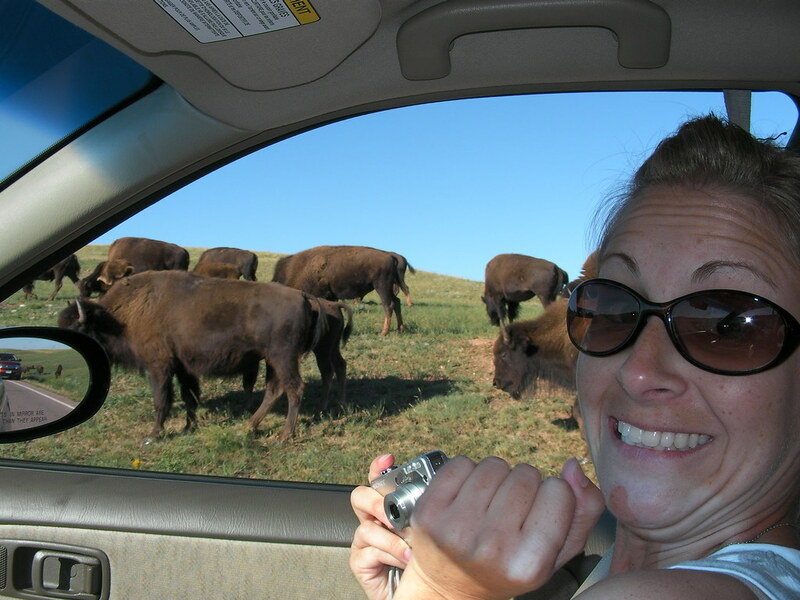 On the way out of Wind Cave National Park we came across a herd of buffalo crossing the park road in front of us where I got one of the funniest animal videos I've ever seen of a buffalo bellowing like he's got a hairball... check the video below. We took a quick detour towards Crazy Horse to check it out but it looked the same to me as it did when I saw it first in 1998 so we decided to skip spending the outrageous $20 to park and look up at it continuing on to Mt. 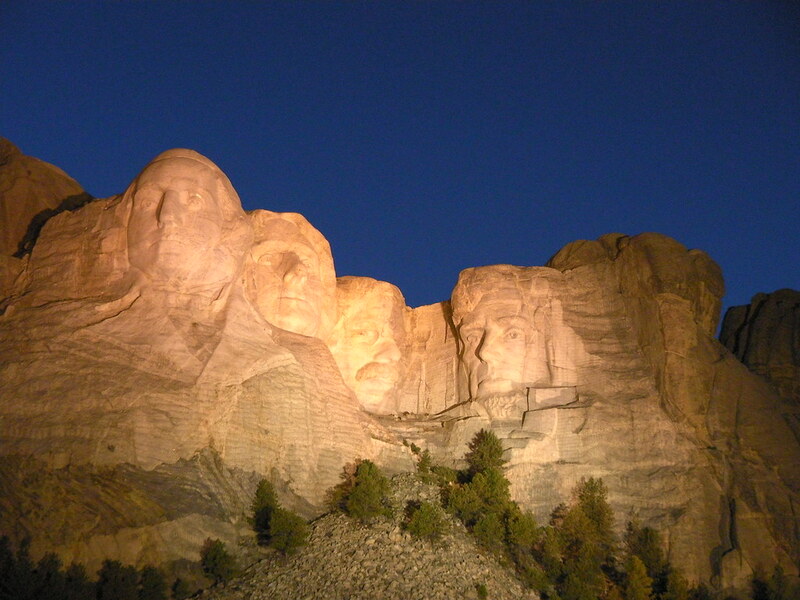 Rushmore instead for the lighting ceremony at 8pm. Driving through the Black Hills was amazing. Emily offered to drive which was nice for me to take a break from the wheel. As we rounded one corner we could look up at Mt. Rushmore from the backside only being able to see George Washington which was pretty cool. When we got to Mt. Rushmore we were greeted to a few Mt. Goats there grazing on the grass which was again a first for Emily to see. 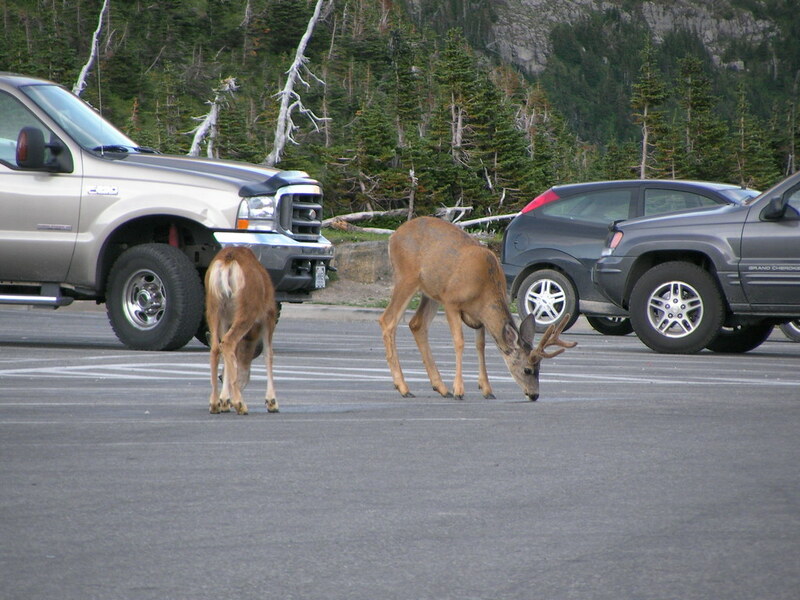 They were very tame and didn't seem to mind us taking photos of them about 5 feet away. The lighting ceremony was really cool. A park ranger talked about the history of the national monument and then a video was played showing why each of the Presidents were picked and what their contributions where to the country. Emily and came away from the event thinking that each of the Presidents would probably be heartbroken at the government we have today. At the end the ranger invited all the veterans onto the stage to take down the flag which we both thought was pretty cool. The walkway to the monument had each of the state flags along the side with the day the state was admitted into the union. After leaving Mt. Rushmore we had a VERY LONG DRIVE towards Amidon, ND where we would climb the highpoint of the state, White Butte the following day. We ended up driving straight through on empty roads until midnight where we were lucky to find a room in the small town of Bowman, ND. We were in horse country so the room had a few flies in it but other than that it was nice enough. 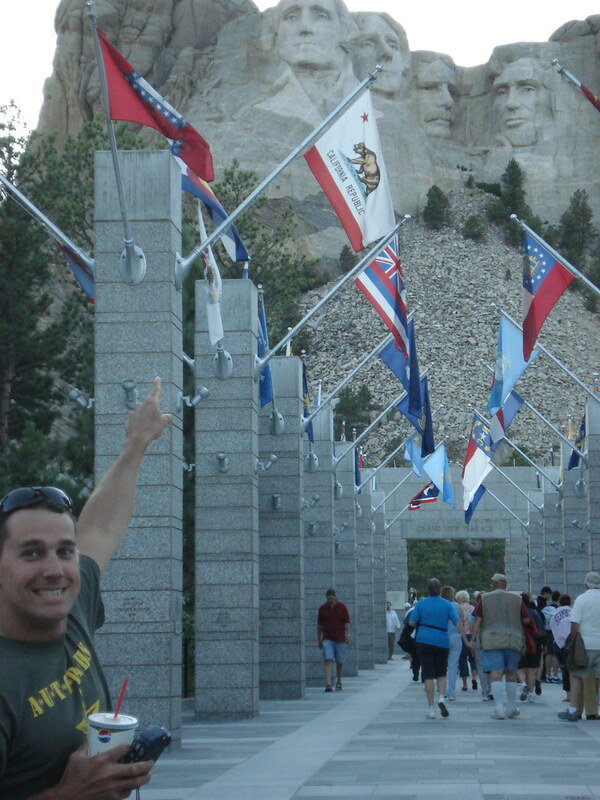 We got up early from Bowman, ND and headed the wrong way towards White Butte right off the bat!... 20 minutes later we discovered we were in the wrong area and had to turn around which set us back an hour. Thankfully White Butte was a piece of cake hike only about 2 miles long. Emily and I made it to the top and back to the car in less than an hour. The only hard part of the whole thing was taking Nina the Nissan down the overgrown farm roads to get to the trailhead which was surrounded by cows. 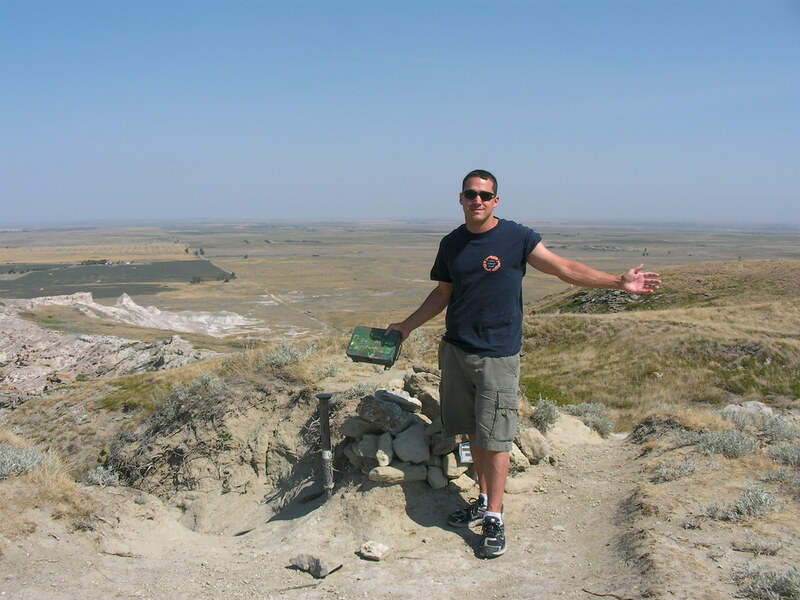 There was a mailbox with a requested $10 fee for climbing the privately owned Butte which we paid. In August the mountain is supposed to be crawling with rattle snakes but luckily for us we never saw one. When we started off on our hike we immediately began to hear buzzing noises that at first scared Emily who thought they were snakes but we quickly found out that they were just hoards of grasshoppers everywhere around us. The top of the mountain had some pretty cool views of the surrounding ranches. 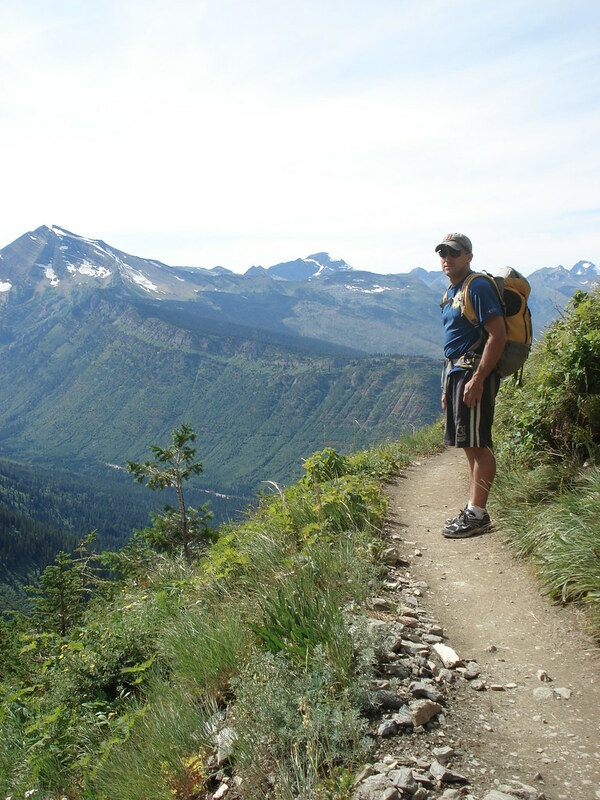 It is always cool to hike on different terrain and this was one type of terrain I'd never been on before. 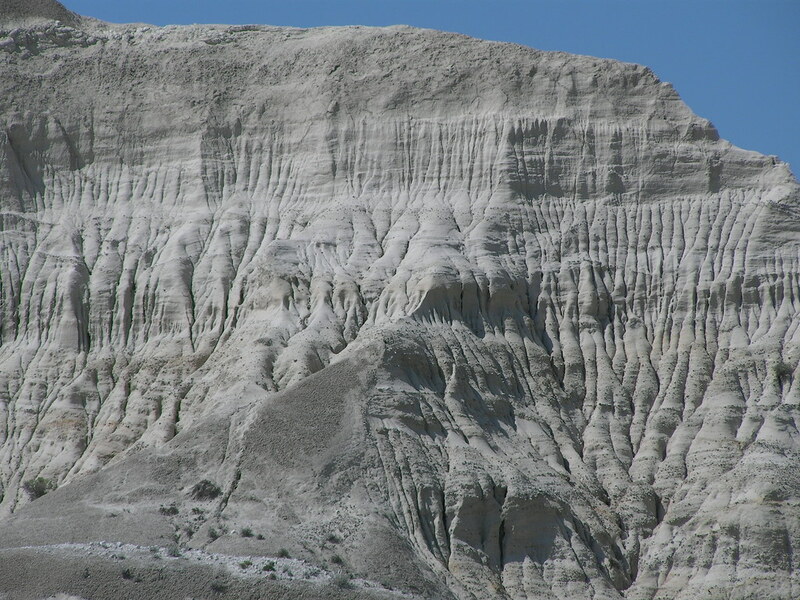 It's white because of the Bentonite Clay found in the surrounding soils left over from fairly recent glaciation of the area. 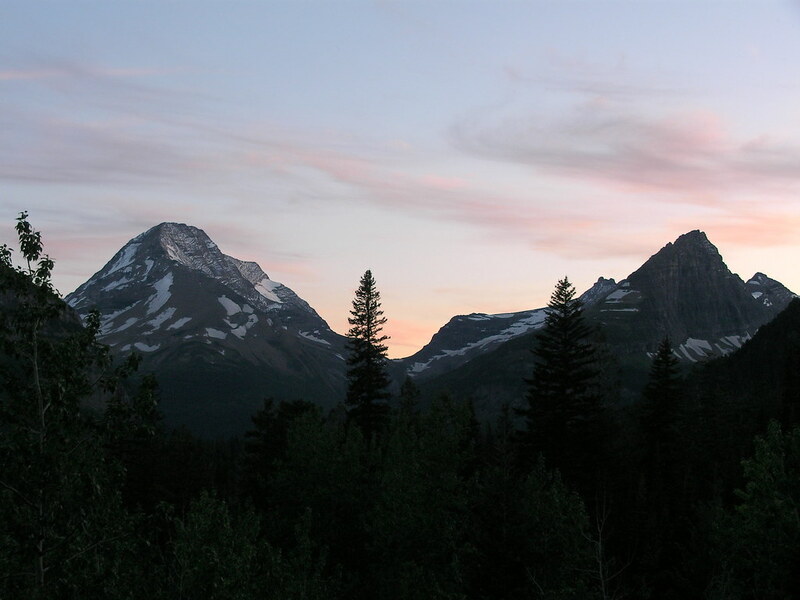 After leaving the high point it was a long drive through North Dakota and Montana towards the town of Cody Wyoming just outside the East Entrance of Yellowstone. We found a nice little motel in town that was fairly cheap and then took a walk through the very rustic looking town stopping at the Silver Dollar Bar for some good ol' country music and beer. It was nice to have a relaxing night after a long drive and the hectecness of trying to find a motel last night after midnight. 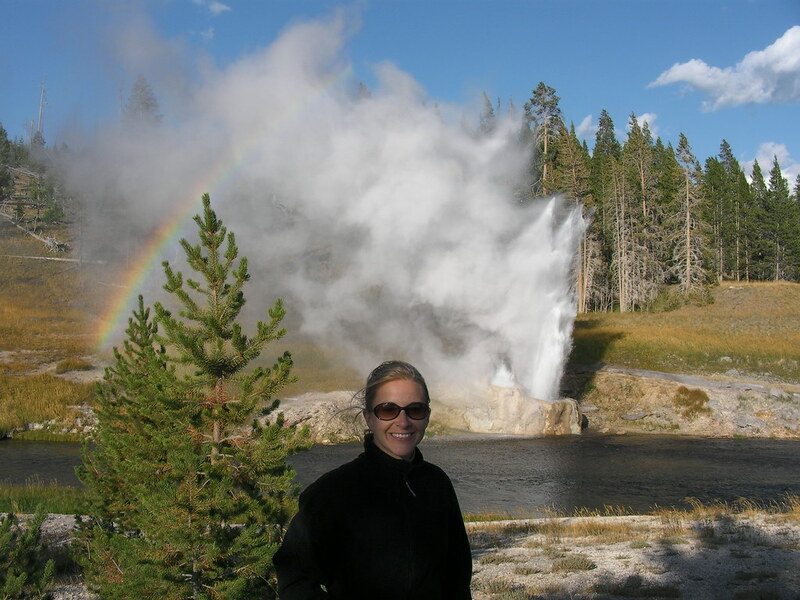 Thursday - Avalanche Peak and Old Faithful in Yellowstone. 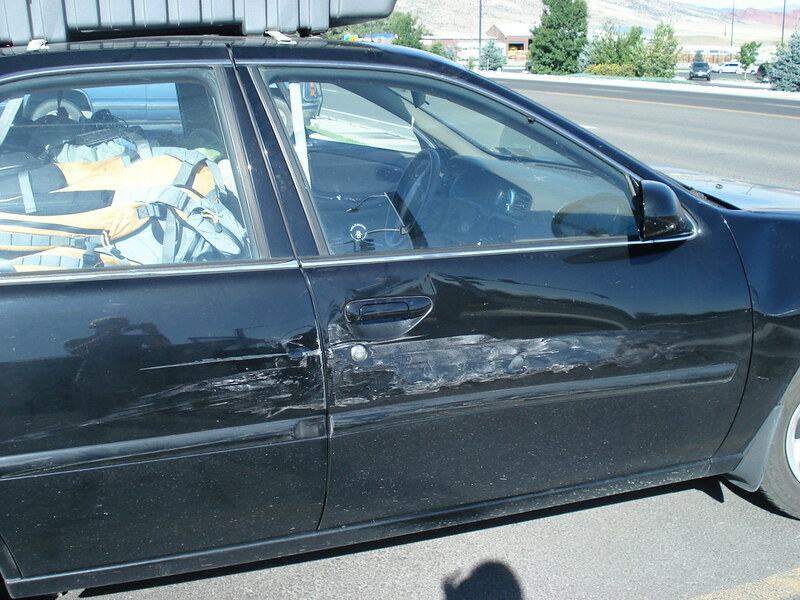 We experienced a minor setback leaving Cody, WY when we were side swiped by an SUV pulling out of a Walmart parking lot. I tried to swerve but the woman crossed two lanes right into the side of Nina. Thankfully I swerved enough to prevent the airbag from going off and really setting us back. We pulled over and found out the woman was super nice and felt horrible about the accident. A young cop showed up and took care of all the photos and documentation for us fairly quickly and we were back on the road within a short hour. We stopped at the last gas station before Yellowstone and could see large forest fires smoking in the distant hills. Hopefully they wouldn't present a problem for our travel plans, and they didn't. 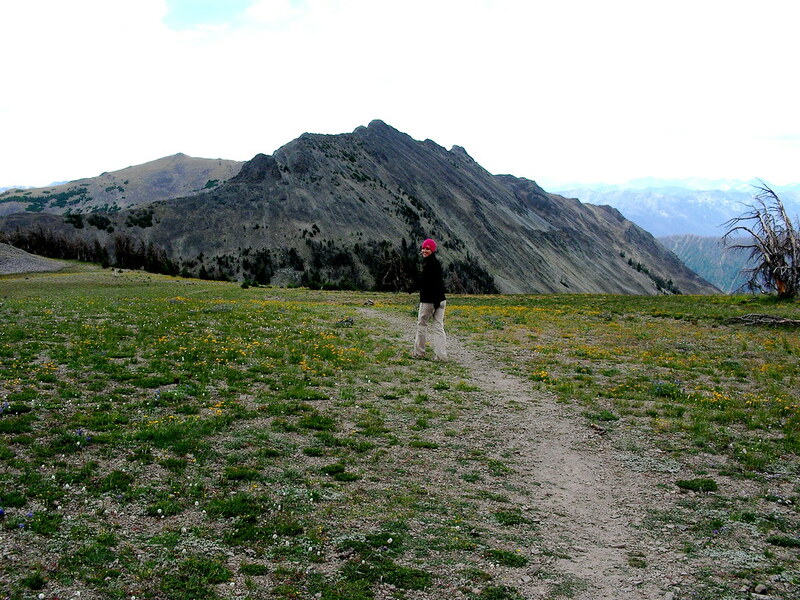 It was about 10:30 when we were able to start our short 4 mile hike up to the top of 10568ft Avalanche Peak on the park boarder. 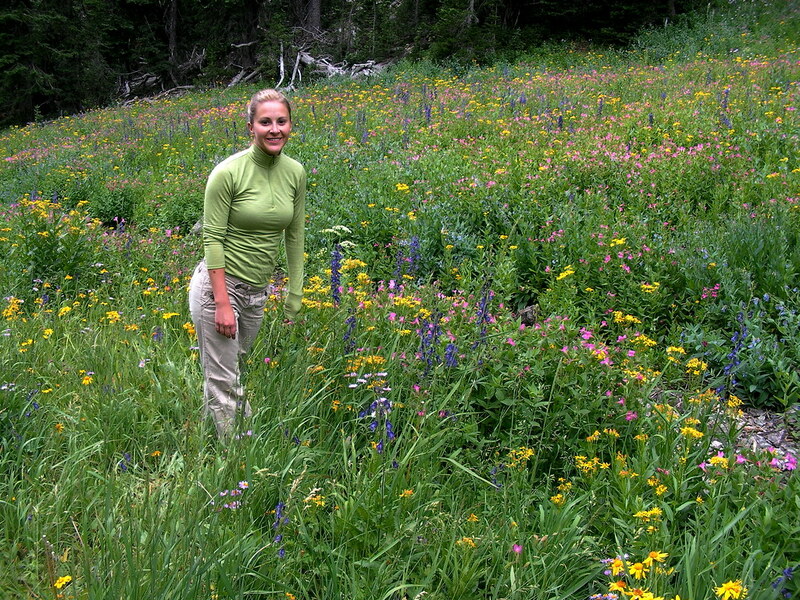 We passed through some beautiful wildflower groves in the open trees before heading onto the open alpine rocky trail to the top. 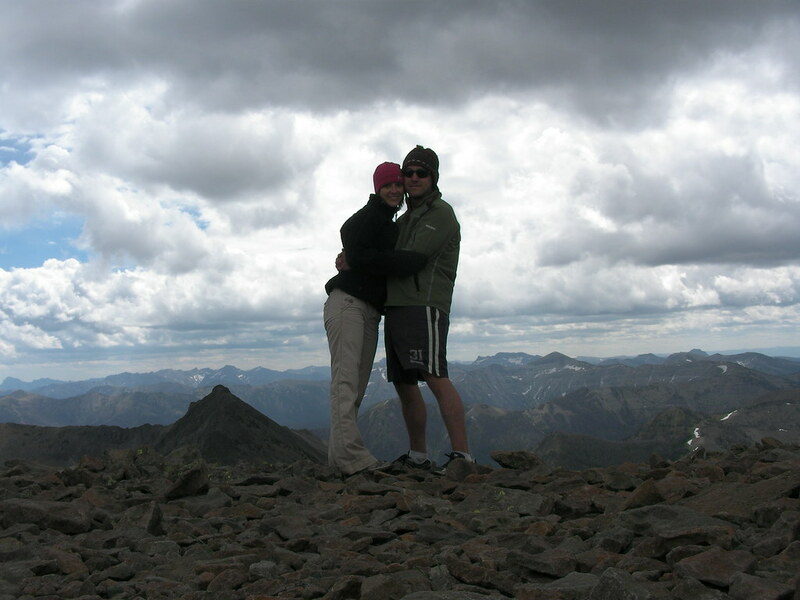 This was the first time Emily had been to the Rockies and was already climbing a very big peak within them. Her feet were hurting and I feared blisters but she said she was ok and we continued on. When we reached the treeline we encountered the wind... wind that was so strong it hurt the insides of your ears and was even hard to stand in. It wasn't cold out but the wind was vicious and we had to take cover when we reached the summit behind a rock barrier. That is where we met a very big ground squirrel who wasn't shy at all. In fact, he was so brazen that he decided to crawl right up on Emily's leg looking for food and kept trying to chew on my backpack zipper. It was unbelievable to me that I almost had to push the critter off our stuff with my foot to get him to stop grabbing at my bag. 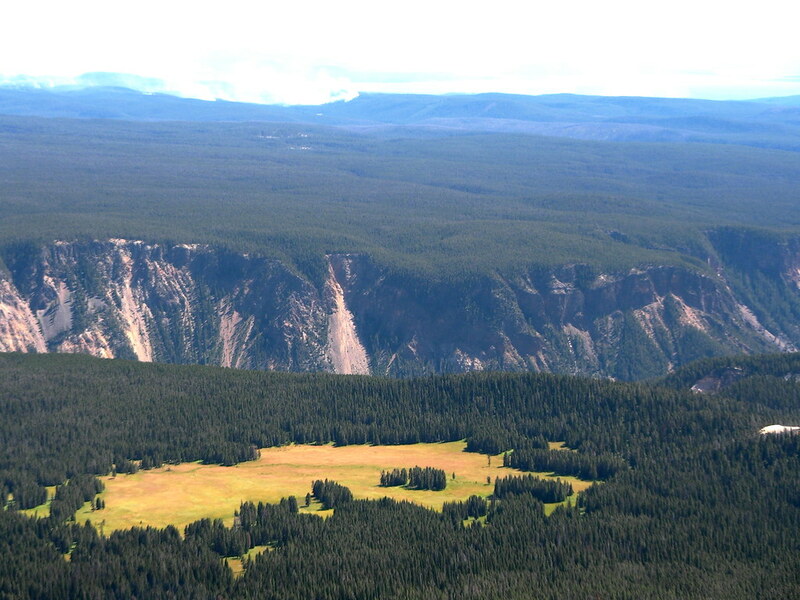 We had great views south and north of the rocky mountains of Wyoming and to the west we could see the shore of Yellowstone Lake which we were headed towards. We had heard that we might see bears but unfortunately we didn't see any animals except for the critter on top. 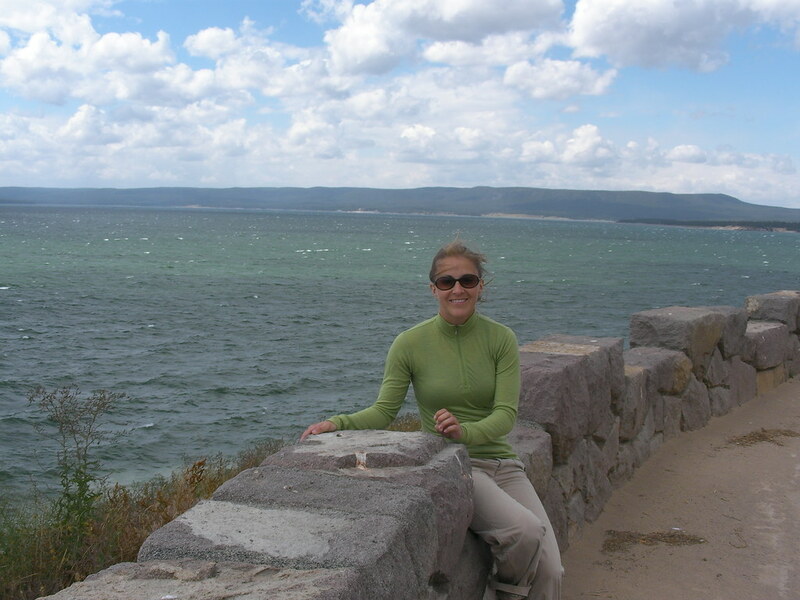 We drove around the shore of Yellowstone Lake stopping occasionally to check out the views in the incredible wind (I'm talking really windy!). 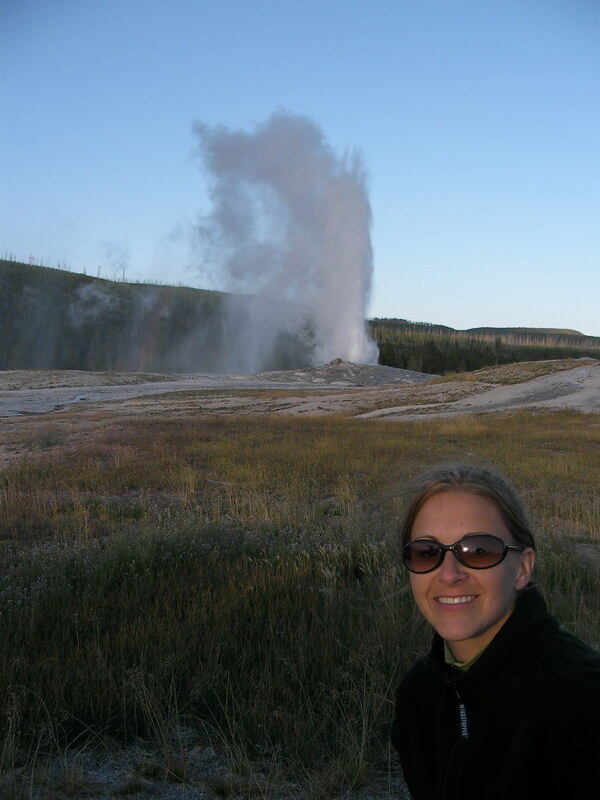 I had printed off a list of the top 10 things to see in Yellowstone so after seeing the shores of Yellowstone Lake we stopped at the West Thumb Geysor Basin so Emily could see her first bunch of geysers. 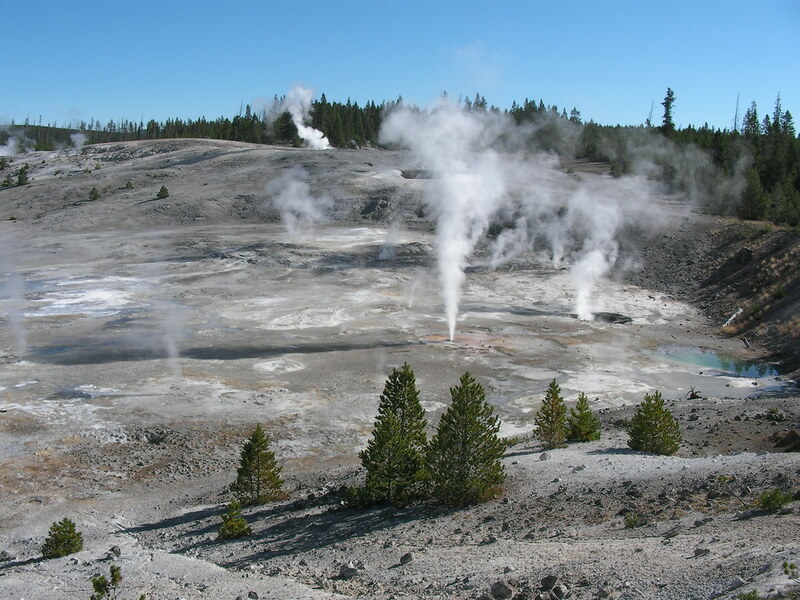 The whole area had been the scene of a volcanic blast years ago forming the caldera of that section of the lake and resulting in the geyser basin seen today. We took a ton of photos of the area and it was cool to see geysers underwater on the shore of the massive lake (biggest alpine lake in the U.S.). 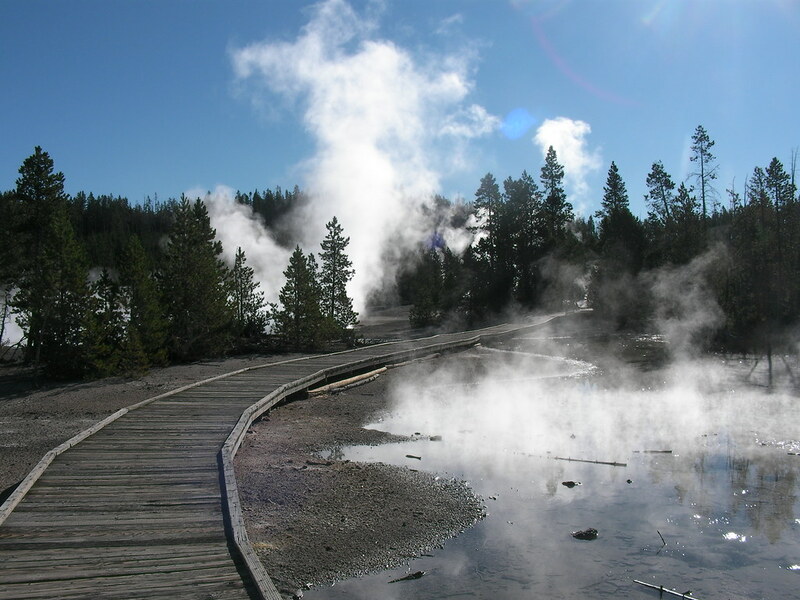 We then drove on to Old Faithful in the Upper Geyser Basin of the park. 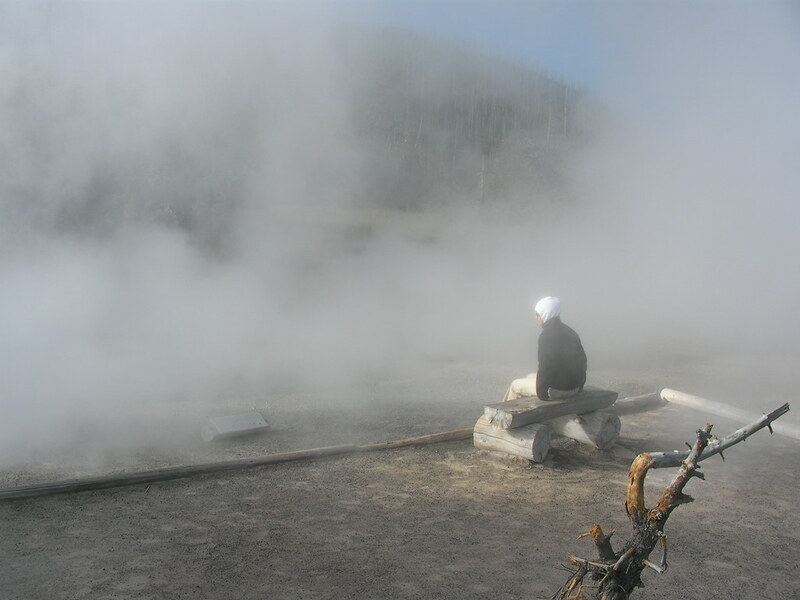 As we pulled in to park it was erupting so we decided to walk around the area checking out all the geysers and pools. We took a a ton of photos from this area so click this sentence to see them all cause they won't fit in this blog section. The best one we saw was the Riverside Geyser that we happened to come across just at the right time on it's 8 hour eruption rotation. When it erupted over the water the mist formed a very cool rainbow as well. 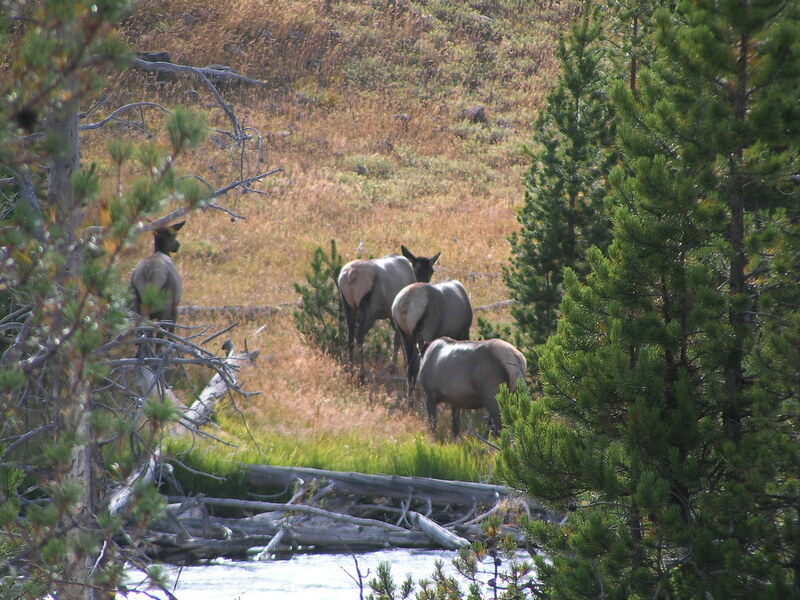 We also got to see some Elk along the river near the Morning Glory Pool while we were there as well as a very cool Peregrine Falcon soaring above us. 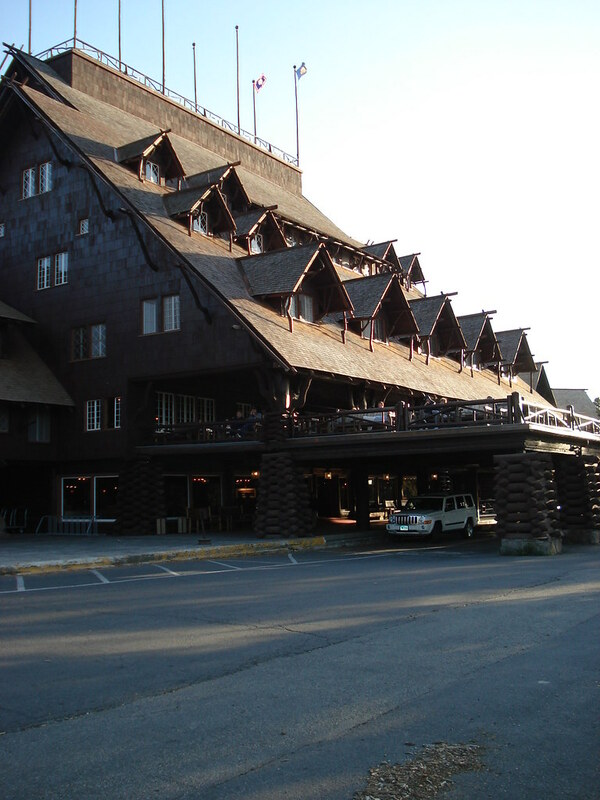 We made it back to the Old Faithful area just before it was scheduled to erupt so we went in the famous Yellowstone Lodge to check it out. Emily was thoroughly impressed by the massive log building and we got a few pictures from inside of it. We came back out just in time to see Old Faithful erupt which frankly I don't think is that impressive compared to some of the other geysers in the area. All the tourists come to see it because it's regular but it really isn't as big or grand as some of the others if you simply take the time to walk around the area. 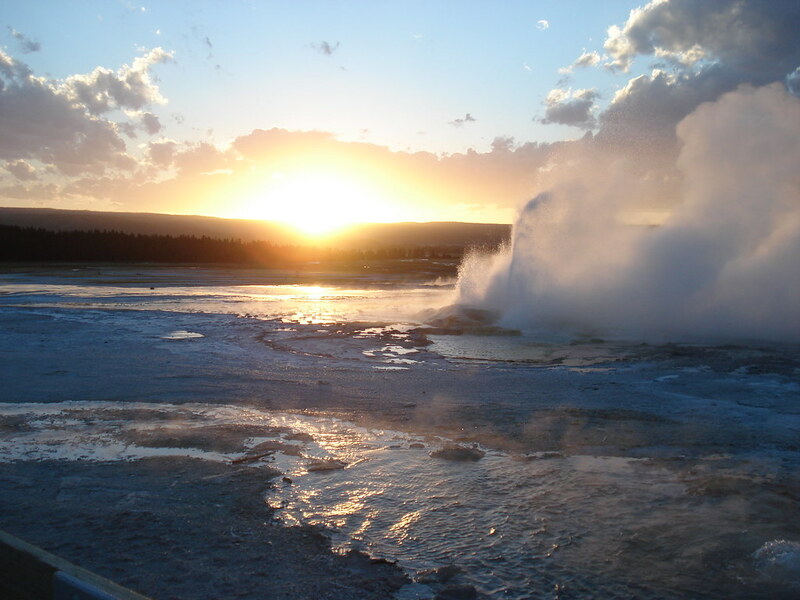 After Old faithful we continued on to the Lower Geyser Basin and the Great Fountain Geyser there for sunset. It was really getting dark quickly so we pretty much ran around the area to check out the mudpots and paintpots of the area. When we got to the Great Fountain Geyser it happened to be still erupting in perfect combination with the setting sun behind it. I'll be honest it was one of the most beautiful sights I'd ever seen and we happened to nail the timing perfectly. We also walked by some steaming vents that sounded like the steam of an old train coming out of the ground. They were really, really loud. 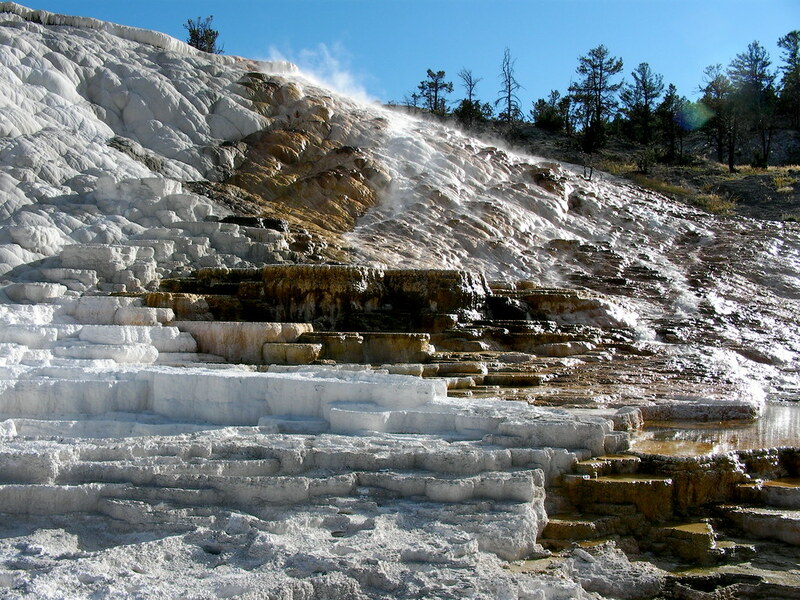 Throughout the year they transition from geysers to steam vents as the water evaporates out of them. After the sun set we found our way to a campground near Norris Junction. We bought some wood and set up our tent behind her car before relaxing near our small fire. It was our first night camping and inflating Emily's air mattress and fitting it in my tent was amusing. What was not amusing was the fact that I was lying on the freezing ground in the morning because the thing had deflated over the sub freezing night.... hehe. 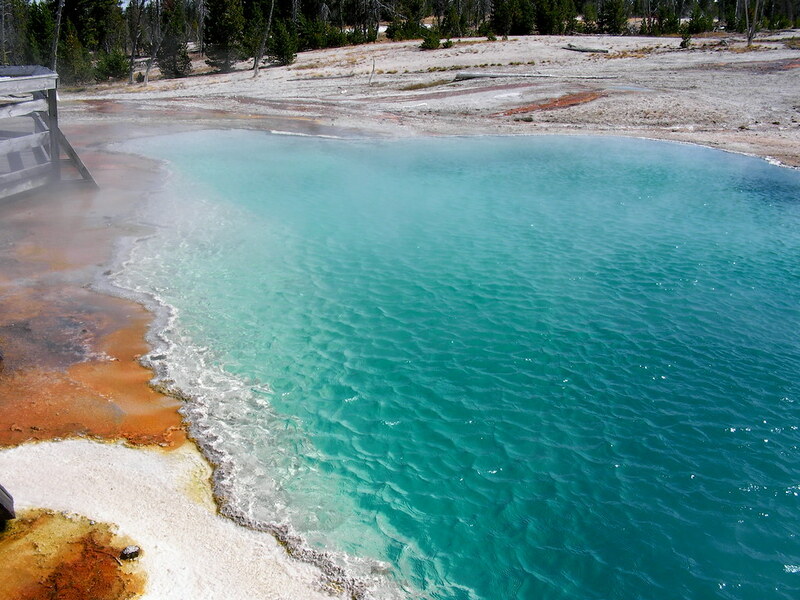 In the morning we got up and drove to the Norris Geyser Basin which was next on our things to see in Yellowstone. I had never been to this basin and I thought it was amazing. Driving up to it seemed like the forest was on fire because it was so cold and the steam from the vents was so visible. We walked the long trail around the area with Emily's foot sore from blisters from the previous day. Again we took a bunch of photos which can be seen here. We had great views towards the mountains to the west and got to see some really cool geologic features. At one stop we sat on a bench right in the steam coming from one of the pools and in about 10 minutes we both had mild headaches from the slightly poisonous fumes coming up from the earth.. yeah, it was dumb and we weren't thinking... hehe. We checked out the small natural history display there before heading off down the road towards the Grand Canyon of Yellowstone and some blister stuff for Emily's poor feet. Before heading to the Canyon we stopped at Canyon city for some breakfast and then took a drive through Hayden Valley to see if we could see any wildlife. We saw a couple stray buffalo off the road but then we came across a big group of people parked on the side of the road. We pulled over as well and were shown a family of wolves in the distance by the river. I tried to get a few good picks of one black one on the riverside before heading back to the Canyon. 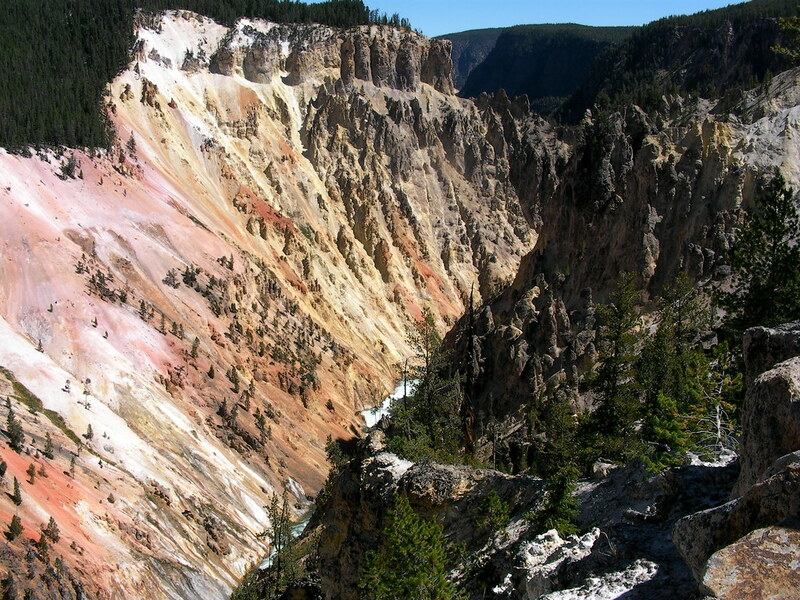 The Grand Canyon of Yellowstone has always really impressed me. The rocks of the area are so much more colorful from the volcanism and sulpher spring activity over the years compared to the actual Grand Canyon in Arizona. When Kenny and I came through we checked out the North Rim of the Canyon but because of construction and road repairs Emily and I were forced to check out the South Rim. We first drove to a lookout just above the lower falls. It reminded me of my trip to Niagara Falls when I was a child. 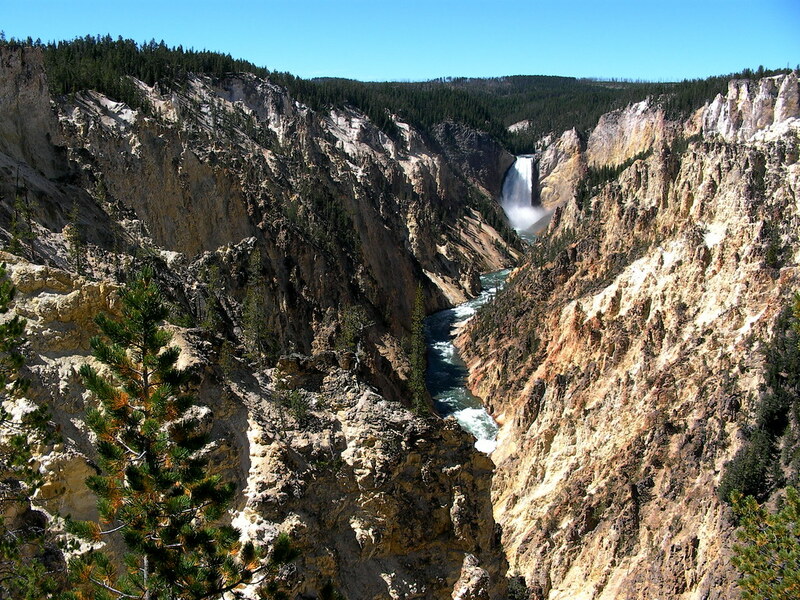 We were right above where the Yellowstone River pours over the edge into the canyon below. Then we drove to the most beautiful point on the Canyon, Painter's Point. I was able to look over the Canyon at where Kenny and I had been standing just two years ago although I couldn't see the Osprey nest in the canyon that we had seen then. Emily and I took a bunch of photos before heading back onto the road towards Dunraven Pass where we would start our climb up Mt. Washburn. In the first quarter mile of our hike up Mt. Washburn we both agreed that it was way more beautiful then Avalanche Peak yesterday and the best hike Emily had been on yet. 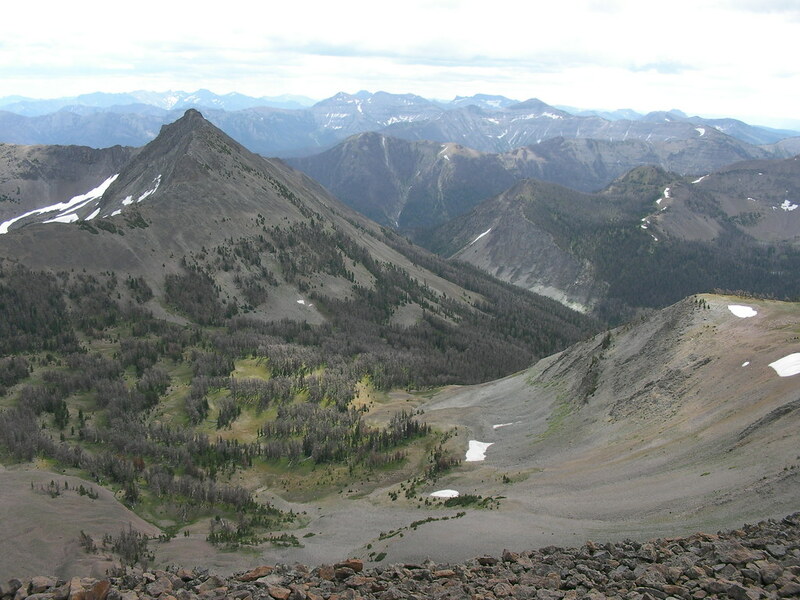 We had heard that it would be a great place to see grizzly bears but again we got unlucky and didn't see any. 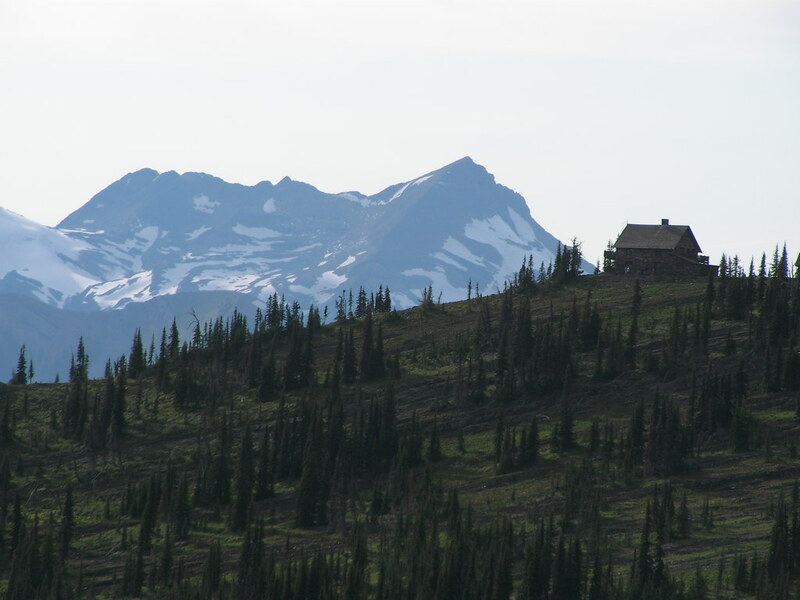 The hike took us through open forest on an old road and through beautiful meadows, winding it's way up the still-used firetower on the summit where a watch-person works all summer long living in the tower night and day. The views from the summit over Yellowstone were absolutely amazing. 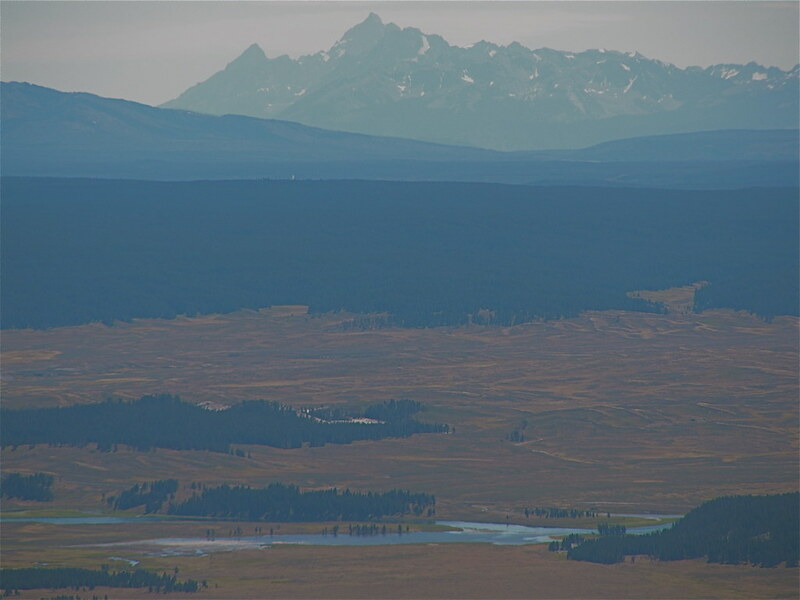 We could see all the way over Hayden Valley, filled with wildlife, to the Tetons towering to the south. 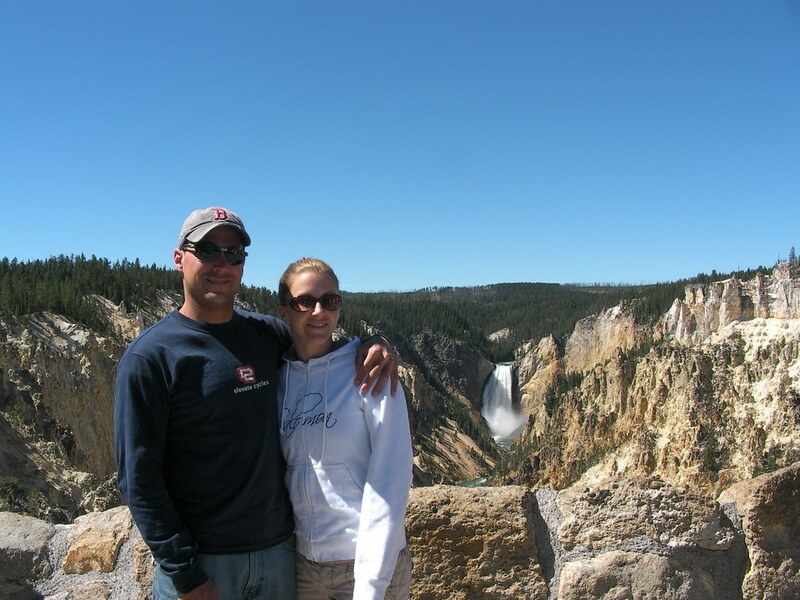 We also had spectacular views of the Grand Canyon of Yellowstone as well as the mountains we came over and Avalanche Peak to the East over Yellowstone Lake. 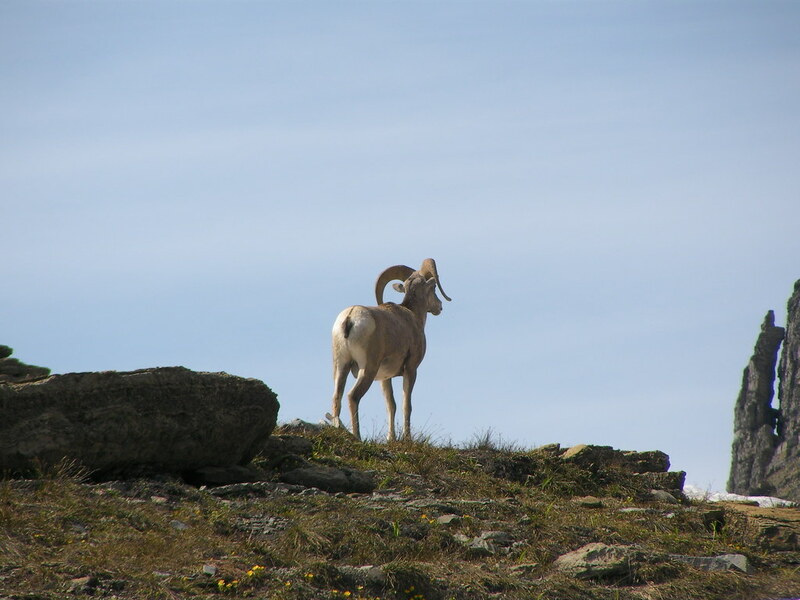 On the way back down the mountain we took some time to climb up some volcanic spires to look over the rock area for bears but instead saw a group of big horn sheep making their way up the mountain towards the top. The hike again brought us to over 10,000 feet in about 6 miles roundtrip but this time there wasn't any wind except for a cool breeze and with Emily's feet taped up she felt ok. Upon leaving Mt. Washburn towards Mammoth Hot Springs I was promptly pulled over by a Park Ranger for nearly doubling the speed limit by accident. I saw him pass but had no clue of the speed limit where I was. Thankfully for us dispatch was busy so he made us promise we weren't felons and let us go which I though was hilarious. I also thought the young guy was hitting on Emily as well asking her about Saint Rose college in NY... hmmmm. We quickly checked out the same boring petrified tree Kenny and I saw so Emily could say she saw petrified wood and continued on. We briefly stopped at Tower Falls because it was on our list of things to see but because the trail down to the base of the falls was closed we moved on. 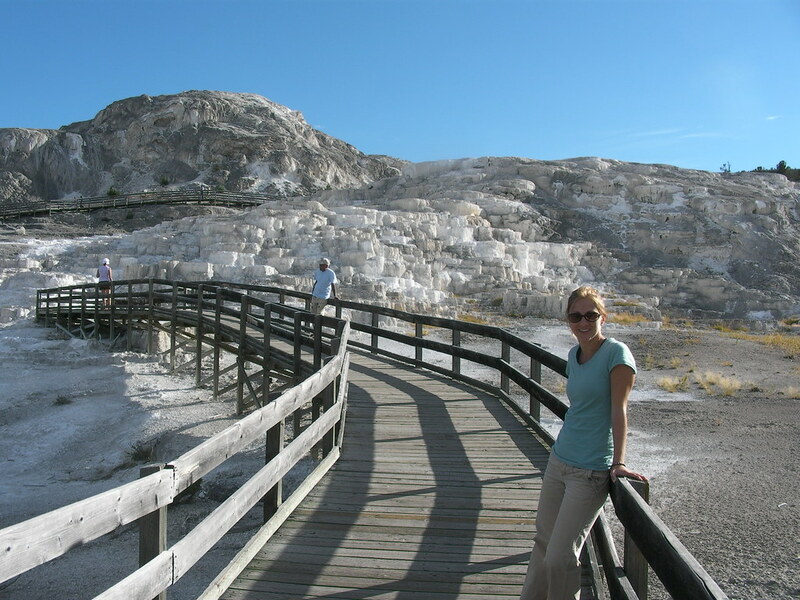 We got to Mammoth Hot Springs with about an hour left of daylight which was slightly more than Kenny and I had. We took a long, windy drive to the top of the springs then walked around the lower ones. It seemed to me as did last time that Painter's Palette spring was the only cool one there because was still running down it. Most of the springs seemed dried up to me. It was still pretty amazing to be on a spring complex the size of a small mountain though. From Mammoth we drove the long distance towards Missoula, MT to stay the night with Rachel and Jon Sprague as did Kenny and I getting to their place around 11pm. 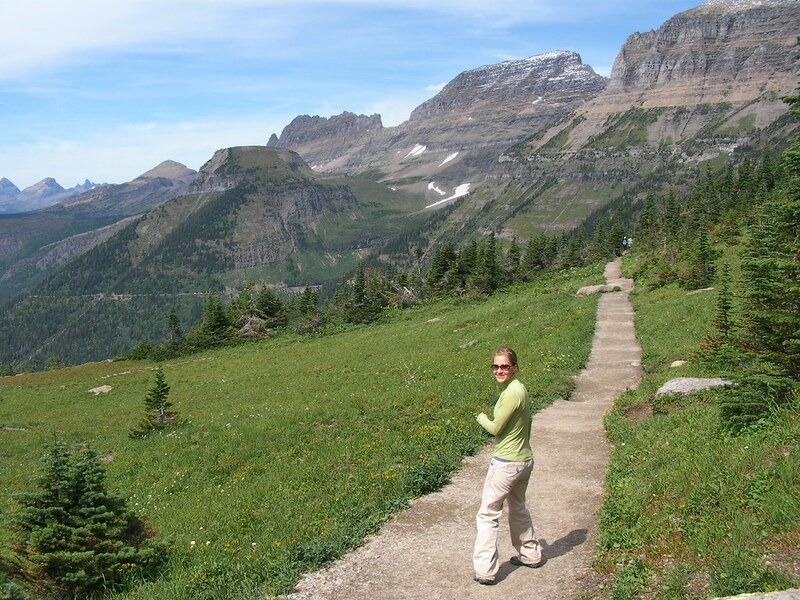 Saturday - Breakfast with Rachel & Jon then the Highline Trail in Glacier National Park. After a wonderful breakfast with Rachel and Jon at the same place we went to with Kenny Emily and I hit the road towards Glacier National Park. This time we only had an afternoon to spend in the park so we went by the short trails Kenny and I had gone on. 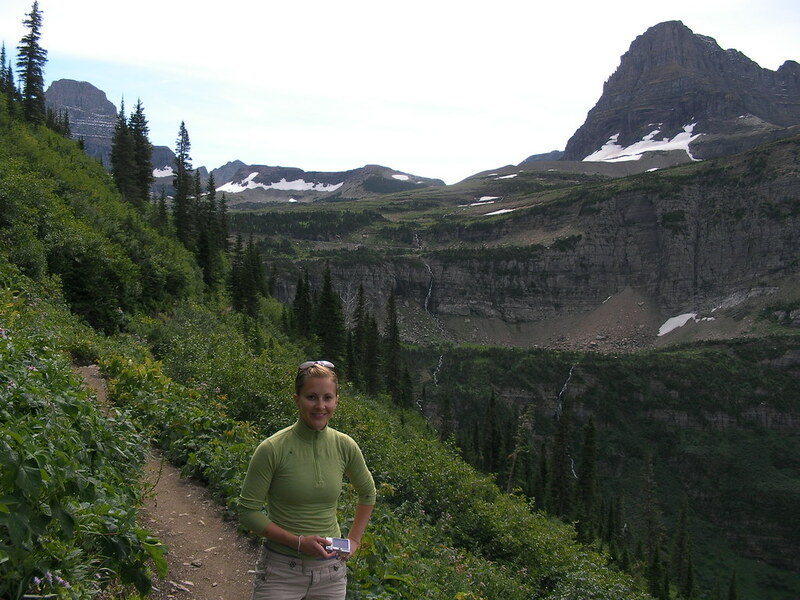 I wanted to finally hike the famous Highline Trail in Glacier so we were really rushing to get to the trailhead in time to finish the one way 12 mile hike in time for the park bus to pick us up and bring us back to Nina at 7pm. 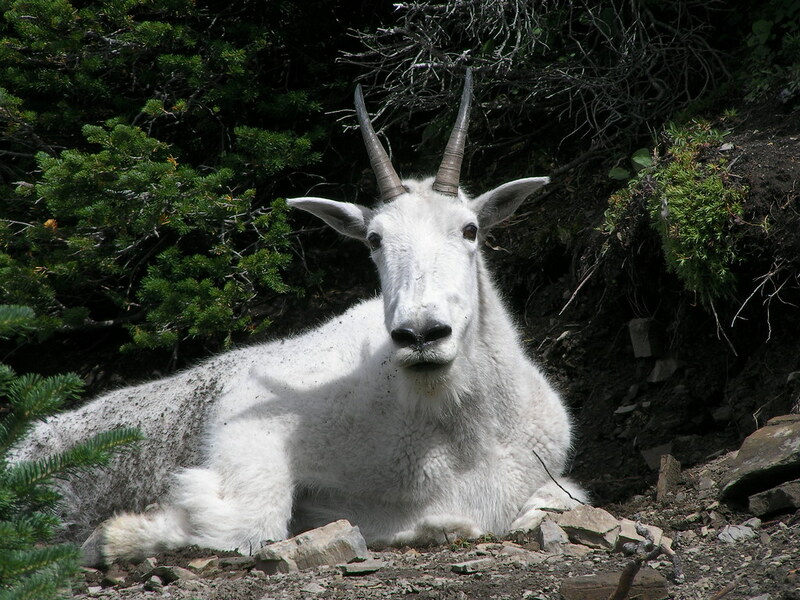 We left at 3:30 and had one of the best hikes of my entire life seeing wild mountain goats the entire way on the trail. We walked by beautiful cascading waterfalls and over snow covered passes while 1,000 feet above the Going to the Sun Highway below. The first part of the hike was along a cliff with a cable bolted to the rock for safety. 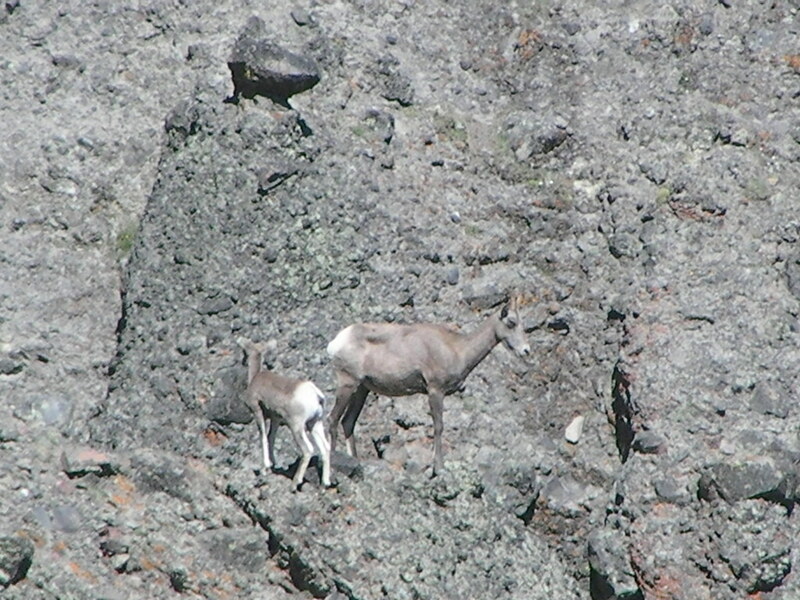 On the shoulder of Haystack Butte on the trail we came across a whole herd of big horn sheep crossing the trail all around us. 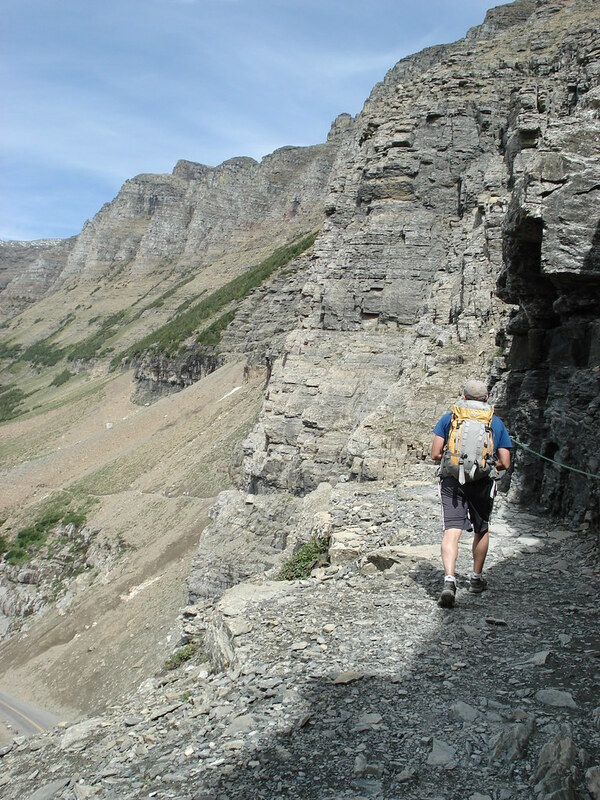 Further down the trail we realized that we were getting low on time and were still a good distance from the Granite Park Chalet marking the end of our trip on the Highline Trail and the start of the descent back down to the park road where we would be picked up. 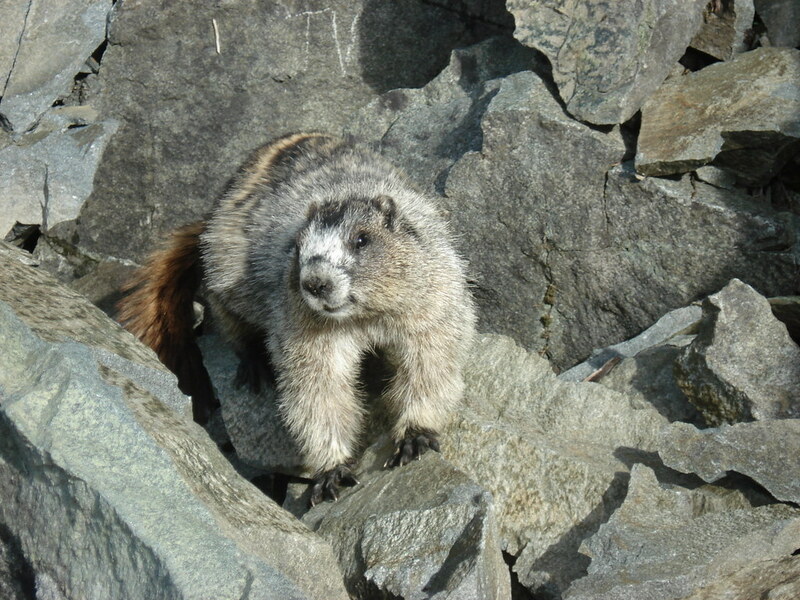 We take time to chat with a very curious Marmot on the trail before continuing on though. 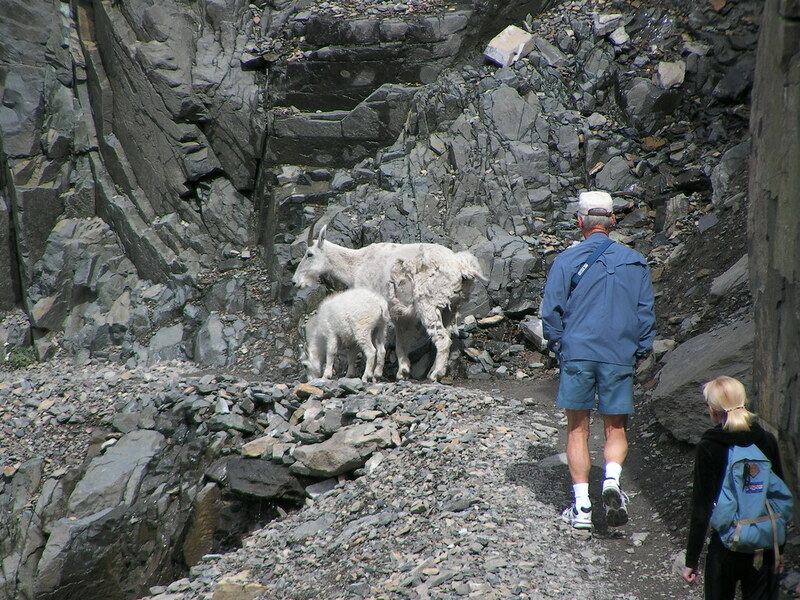 There were mountain goats and sheep everywhere around us. 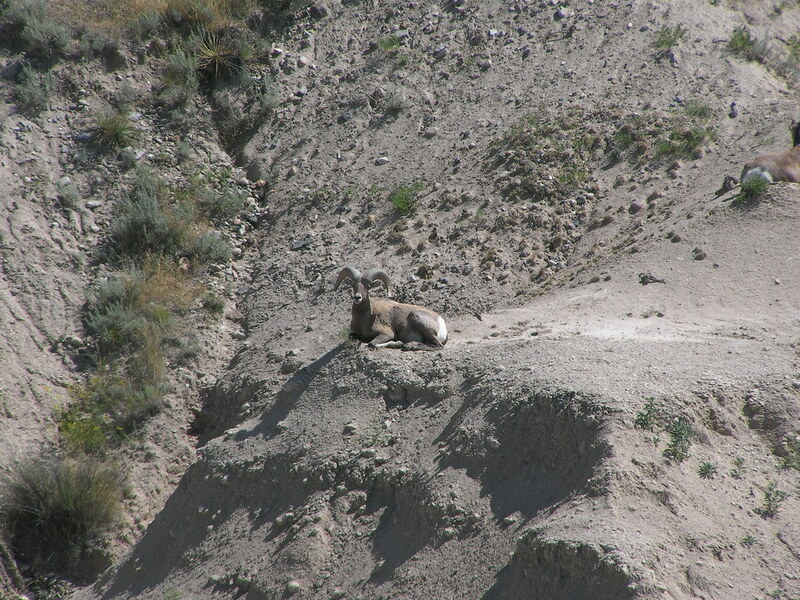 At one turn in the trail we saw one resting on what looked to us to be a sheer cliff. I told Emily to run down and stand on the trail above it to give perspective as to where this goat actually was perched. We got a ton of absolutely beautiful photos which you must check out by clicking this sentence. When we got to the Chalet we had about 45 minutes before the Shuttle pickup at 6:50pm on the road below... and then we saw the sign.. 4 miles!!! I thought it was going to be 2 at the most... This of course meant we might be stuck and have to hitch hike! So, we decided to run down the trail to the road. With a backpack on I got worn out doing this and by the time we reached the road Emily and I were both exhausted. I had planned to get to the road by 7pm but the only sign noting the shuttle was at the Chalet and it said 6:50 instead... But, we both did make it by 7pm and thankfully the shuttle was late and we were able to catch a ride back up to Nina at about 7:15pm. 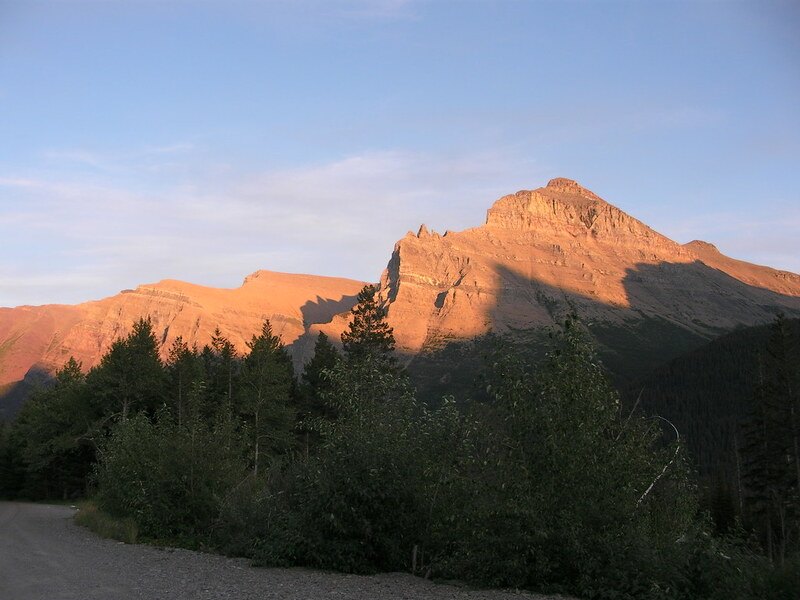 When we got back up to Logan Pass there were deer all over the parking lot and we had plenty of time to drive down to St. Mary's lake to watch a beautiful sunset over the mountains. Emily's feet were really sore and my legs were exhausted so we decided to drive out of the park and try to find a motel to stay in . Everything was filled up for the weekend so it took us nearly till midnight to find a place to crash. It was an exhausting day but the beauty of what we saw was worth it and after a shower in the motel we both felt a lot better and ready for the last day drive to Corvallis. 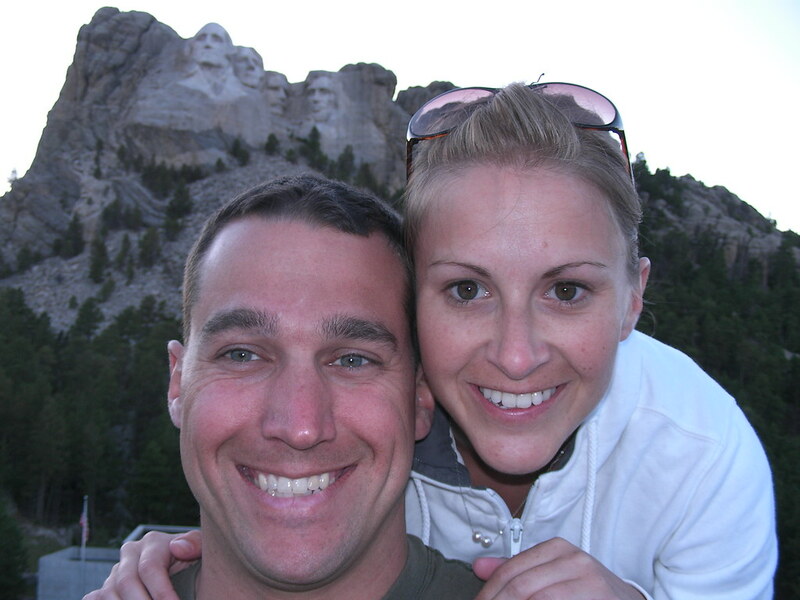 Sunday - Leaving Montana and heading to Corvallis to start our new lives together. Sunday was fairly uneventful in the fact that it was simply us driving to Corvallis. We got to drive on I90 over the beautiful mountains of Idaho which Emily thought were cool, not knowing that northern Idaho was known for great river rafting and big peaks. 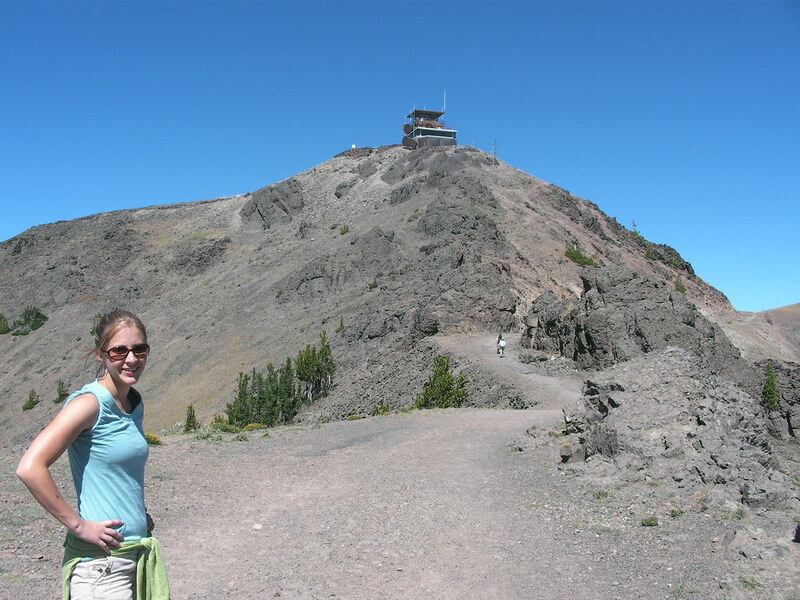 We then took a detour because we had some time to go over Willamette pass so Emily could see the lava flows from Little Belknap Crater and check out the Dee Wright Observatory there. The trip down in the dark from the pass on the windy road scared her a little with my crazy driving but we pulled into our new apartment in Corvallis at about 10pm, ready for a good night's sleep before I headed to work today. It was a fantastic trip and I am so happy I was able to share it with my Emily. She had never seen the interior of the country before and I feel that the trip, although it was short, really took us to some of the key places within the U.S. Now we are excited to explore the remainder of the Pacific Northwest together... and then the world!